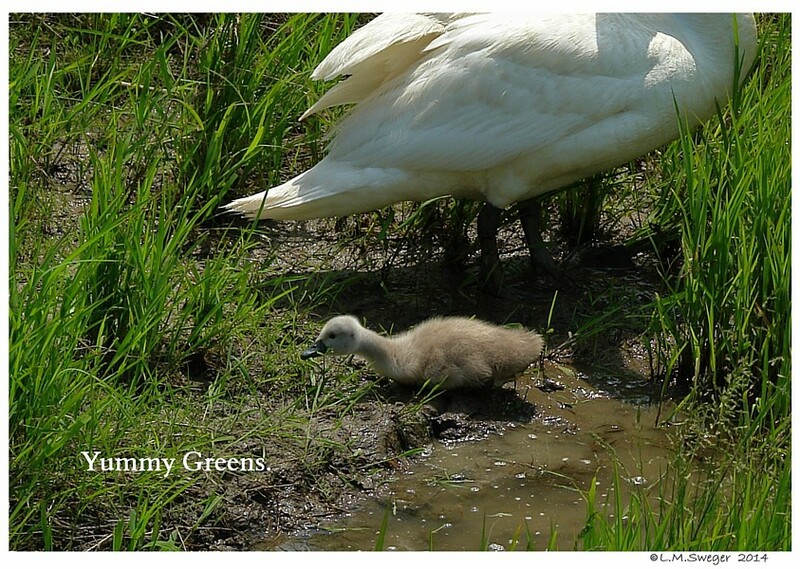 IF you are LUCKY and Cygnets Hatch to your Swans in the Spring. REMEMBER these are CAPTIVE Conditions. 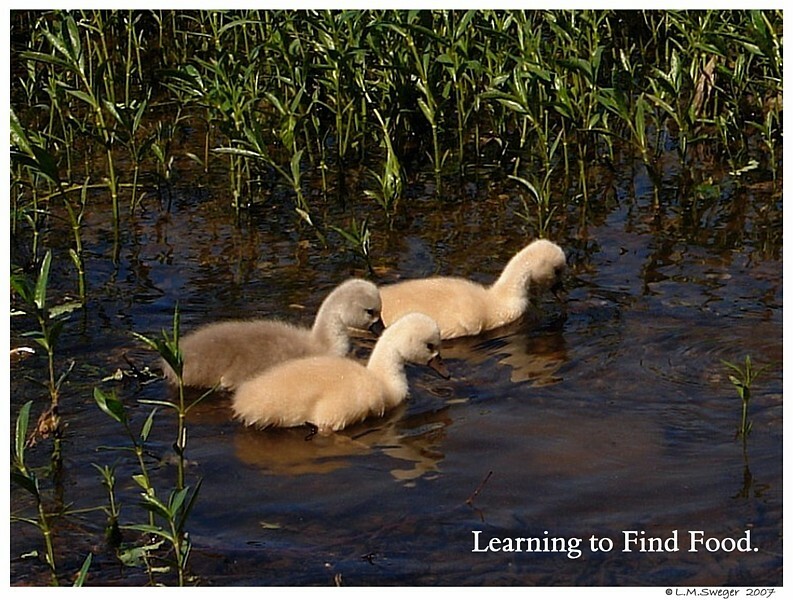 It is important to understand how your Swans would care for their Cygnets in Natural, Wild Conditions. You will need to Provide some Special Feed for the Cygnets for their Healthy Development. 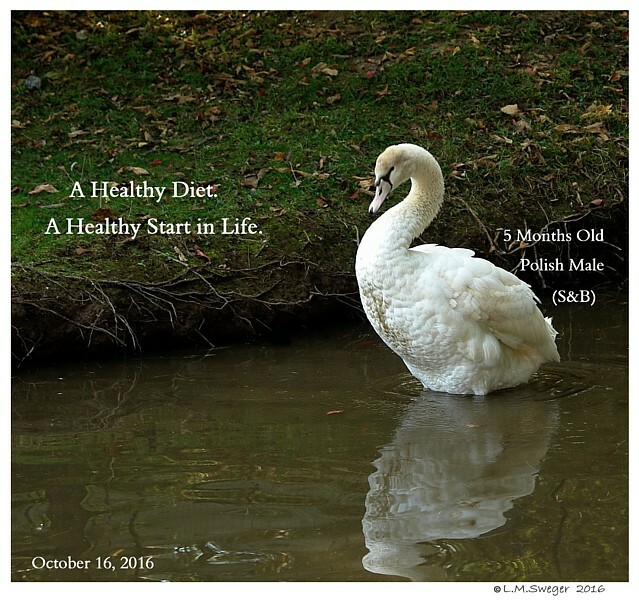 FEEDing Swan Cygnets – A Healthy Start. THIS IS A WORK IN PROGRESS…. It may Never be Finished. I am still collecting, learning and checking on information for this Topic. I have been observing, reading and collecting the BEST General information I can find for the Feeding of Mute Swan Cygnets. I have checked with our Avian Veterinarians, Poultry Specialists at the PA Department of Agriculture at Harrisburg and the Folks who work in our Local Commercial Feed Store. There are many ideas, some make sense and seem to be a healthy approaches. Then there are others… I will not suggest. 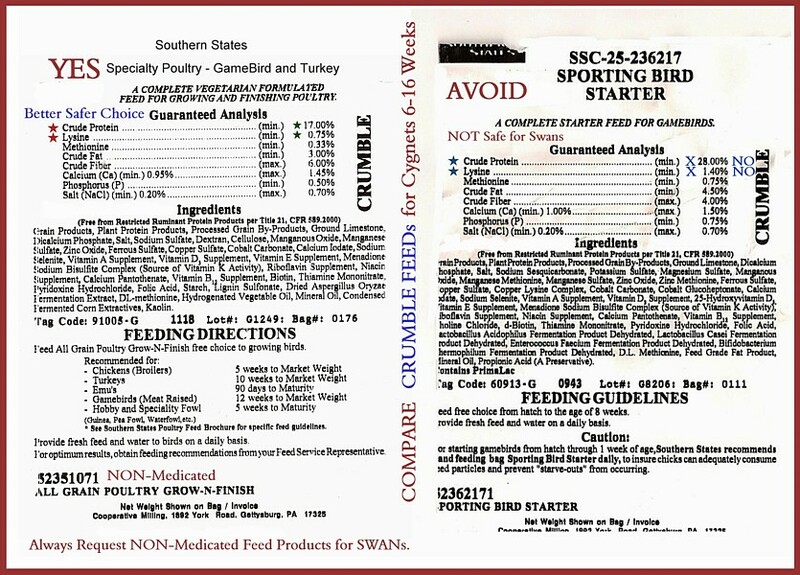 PLEASE DO NOT Feed these Feed Formulas to Swans. prepared by any Manufacturer in the USA. 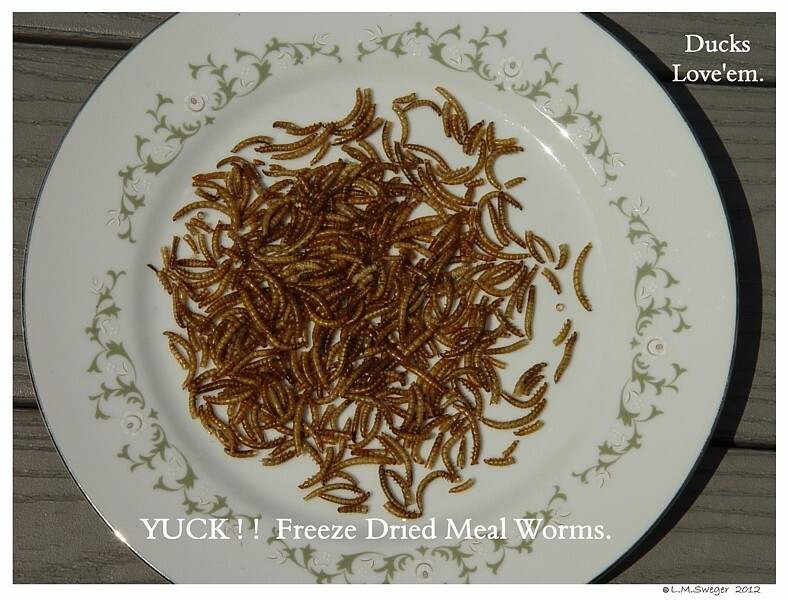 You will need to do your BEST to Find and Mix Feeds for their good Health. Some Commercial Bag Feeds are a good starting product. With some modification/mixing they will provide a healthy Swan Diet. 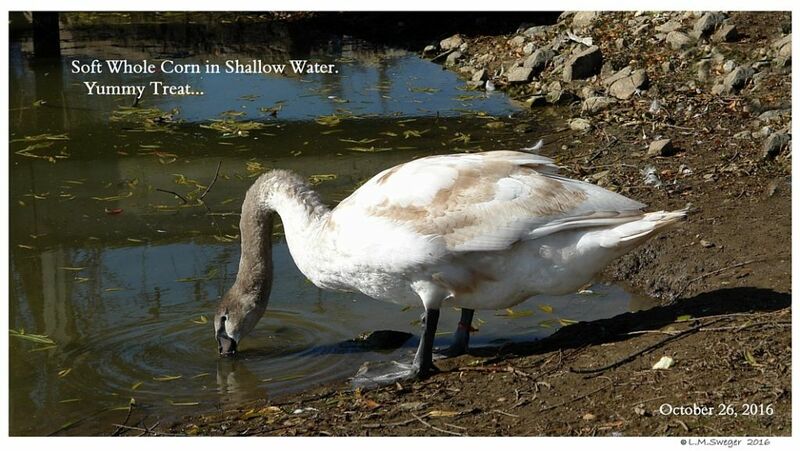 NOTE: If a Swan tries to Eat TOO Fast.. the Dry Feed may get STUCK in their Esophagus and Block Swallowing. Forming a Condition called CHOKE. Cracked or Whole CORN is NOT a Complete Diet. 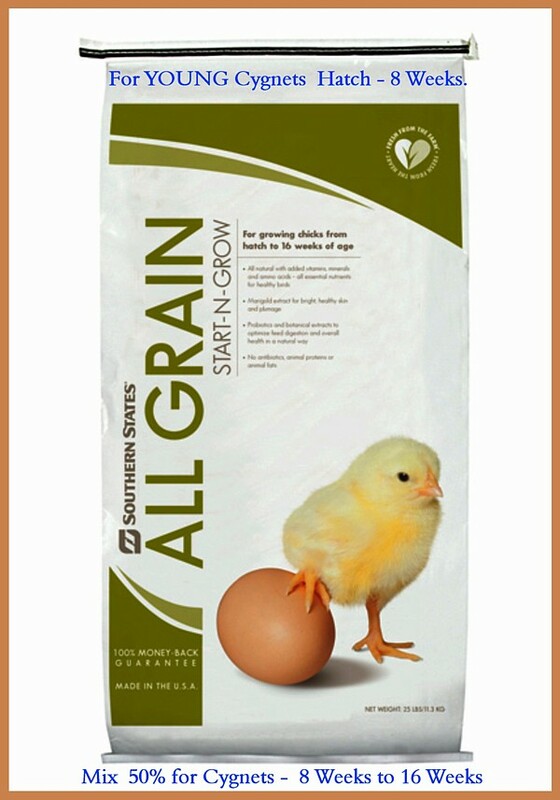 It is helpful as part of a Healthy Feed Mixture. 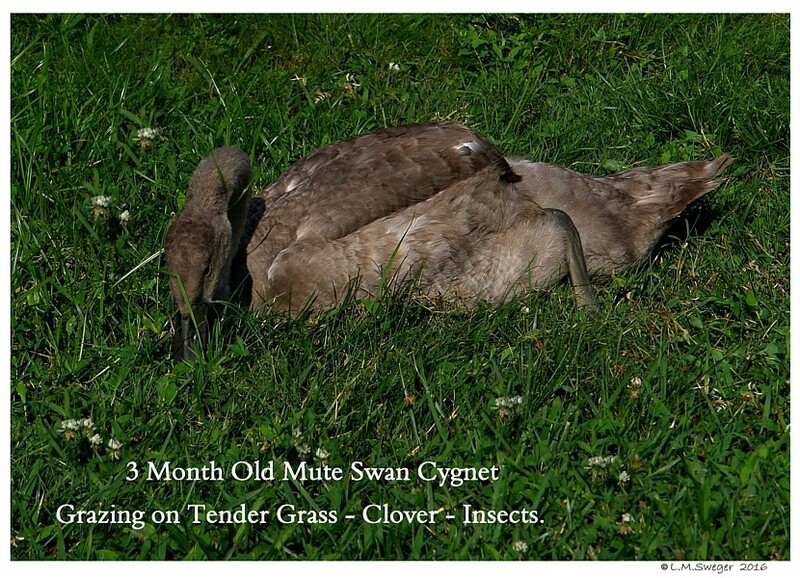 I am sharing this with you, hoping some of this information may benefit you and your Swans/Cygnets. 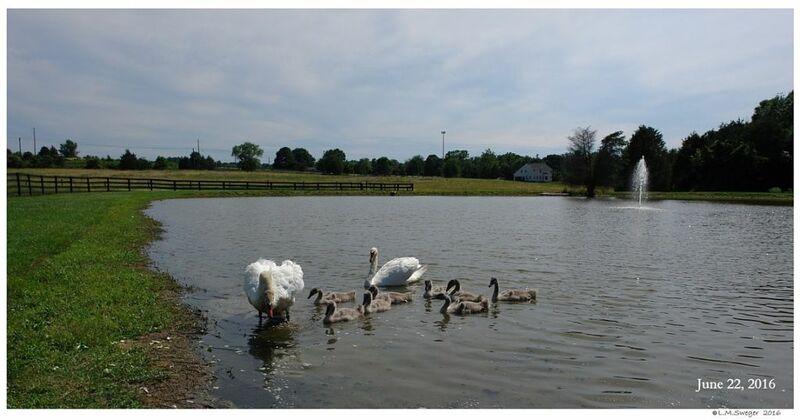 Captive Swans and their Cygnets that live on a Pond or Lake where there is Chemical or Biological Run-off of Lawn Care Products and Fertilizers to control Weeds/Plant growth and/or Insect Control may not be living with enough NATURAL Plant and Insect variety to ensure Proper Balanced Nutrition. 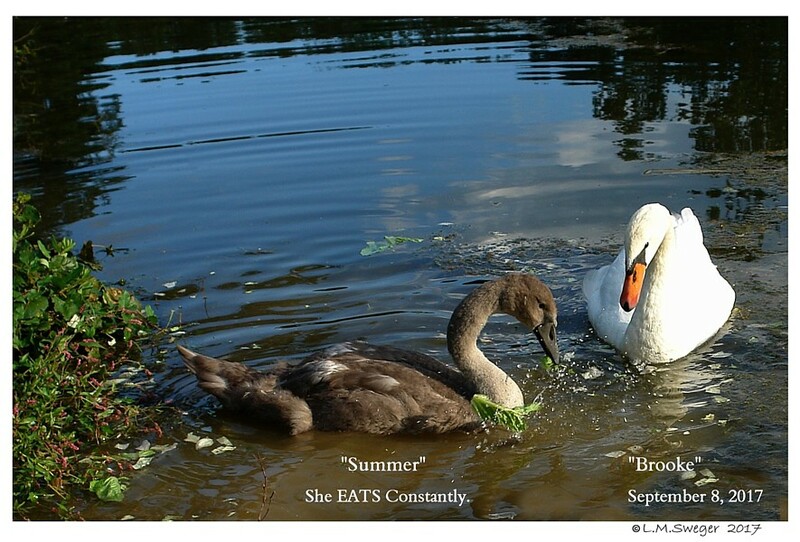 Supplemental Feed will help Round-Out the Swans’ and Cygnets’ Diet. 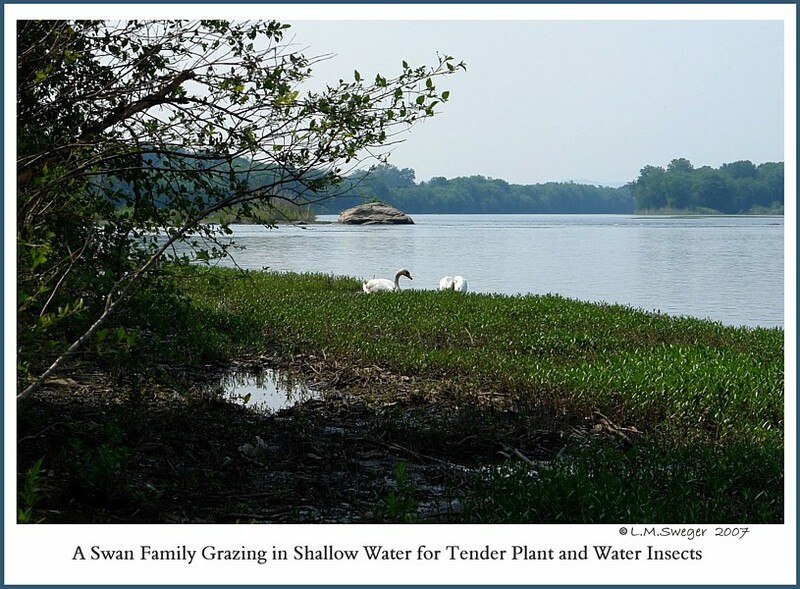 Well-Fed Healthy Swans are more content, will have FEWER Health Problems. 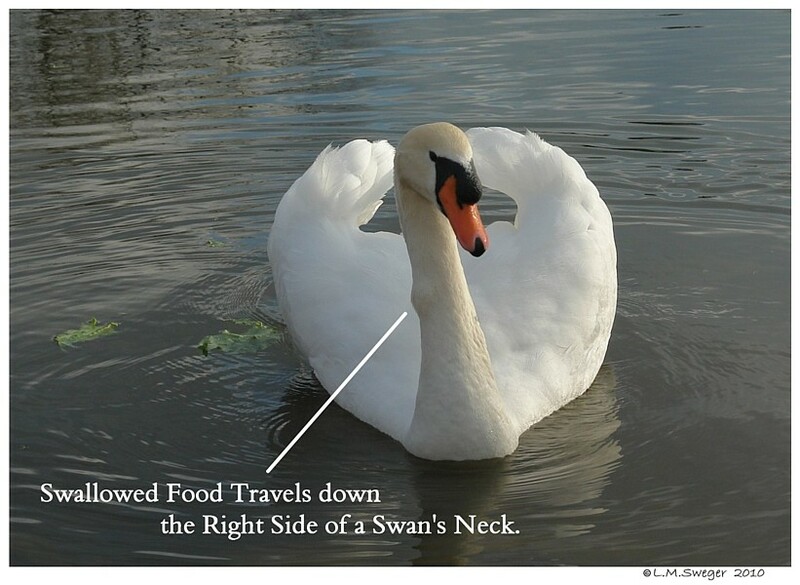 SWANs require a Diet, different from Duck, Geese, Turkeys, Chicken. Their Protein intake needs to be lower then what other Waterfowl require. 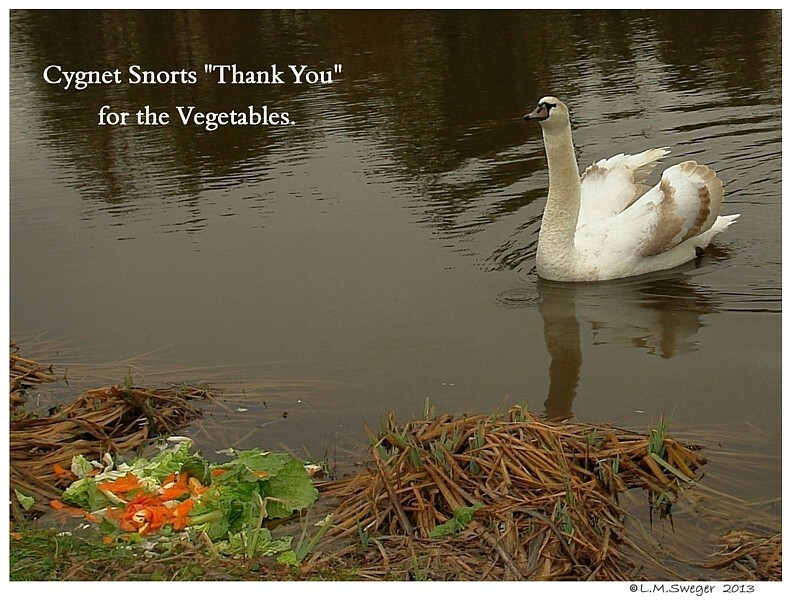 ALL Swans are Vegetarians, their basic diet will be 80-90% Plant based. 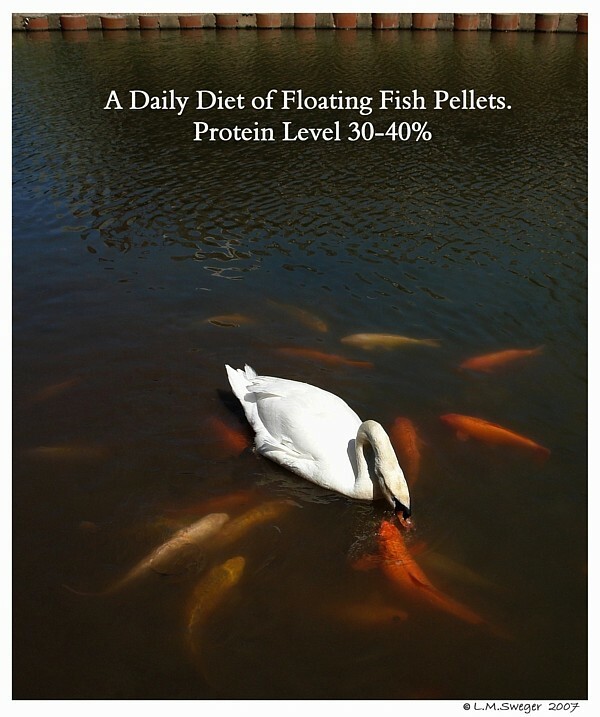 I see Folks Feeding “Fish Pellets” – Not good as a Diet – Maybe a few for Treats. – a Fatal Liver Condition. This significantly shortens a Swan’s Lifespan. Used for the Male during the Breeding Season. With Good Health and Care may Live 25-50 years. Pen – During Nesting Time the Female Parent of a Clutch of Eggs. With Good Health and Care may Live 20-30 years. Females have a higher Mortality Rate during Nesting. Clutch – The Eggs in the Nest. 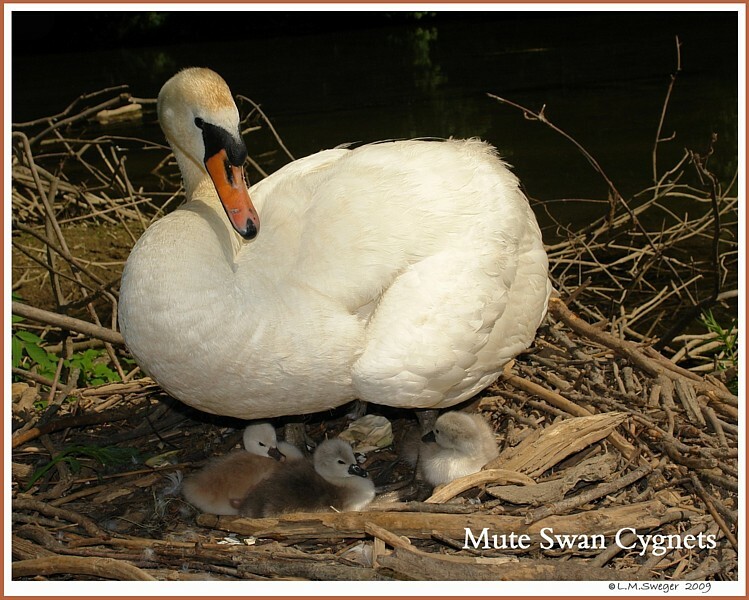 Brood – A Group of young Birds (such as Cygnets) that were all Hatched at the same time. 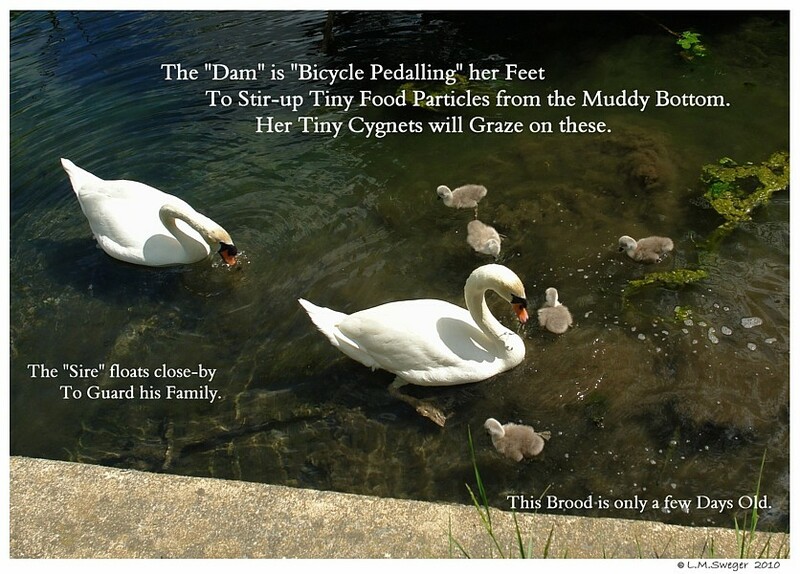 Dam – The Female Parent of a Brood of Cygnets. 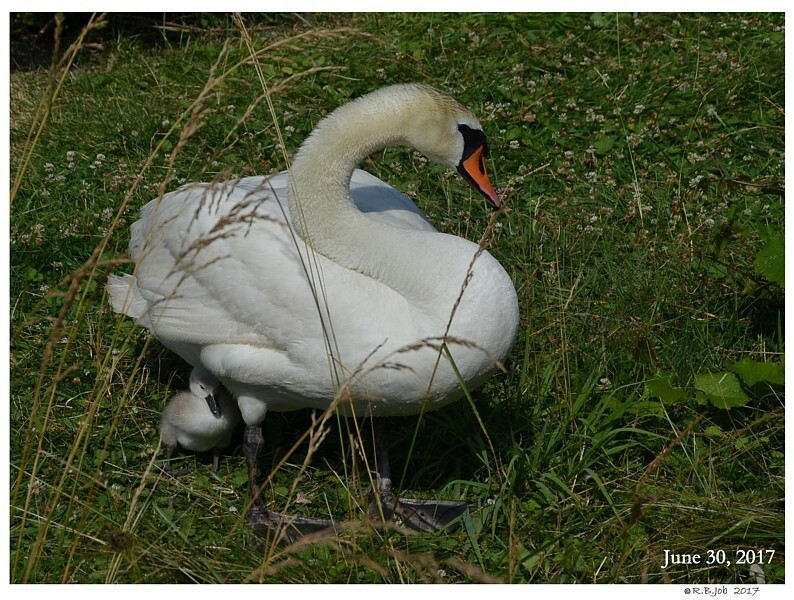 Sire – The Male Parent of a Brood of Cygnets. 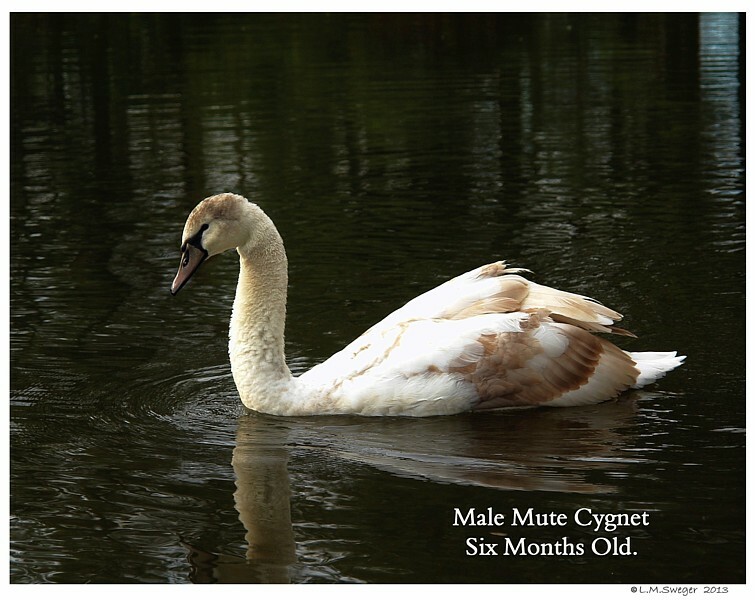 Cygnet – A Young Swan from Hatching until One Year Old. 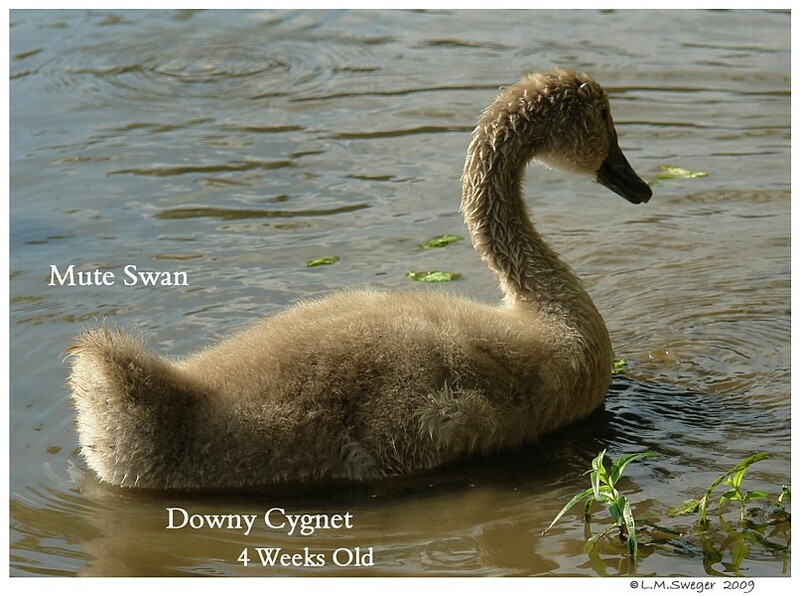 Downy Cygnet – The Stage before Feathers grow In. 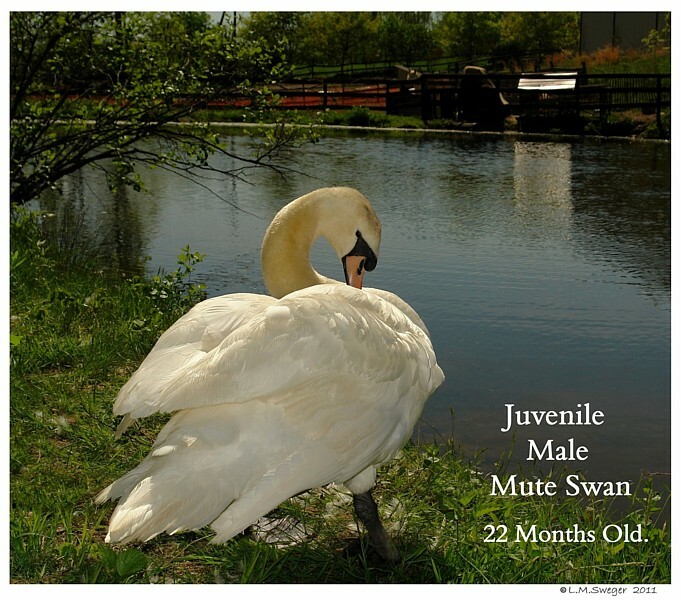 Juvenile – A Young Swan from One until Three Years Old. Precocial refers to Bird species in which the young are relatively mature and mobile from the moment of Hatching. meaning that they leave the nest shortly after Hatching (24 hours). Precocial Birds Hatch with their Eyes open. They are covered with “Downy Feathers”that will be replaced by Feathers-Plumage. 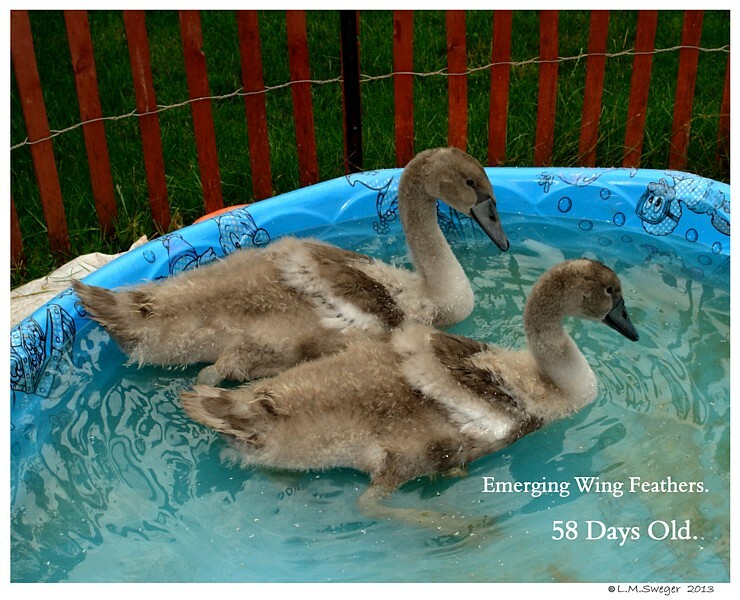 Precocial Birds can also Swim and RUN much sooner after they Hatch than other Birds. 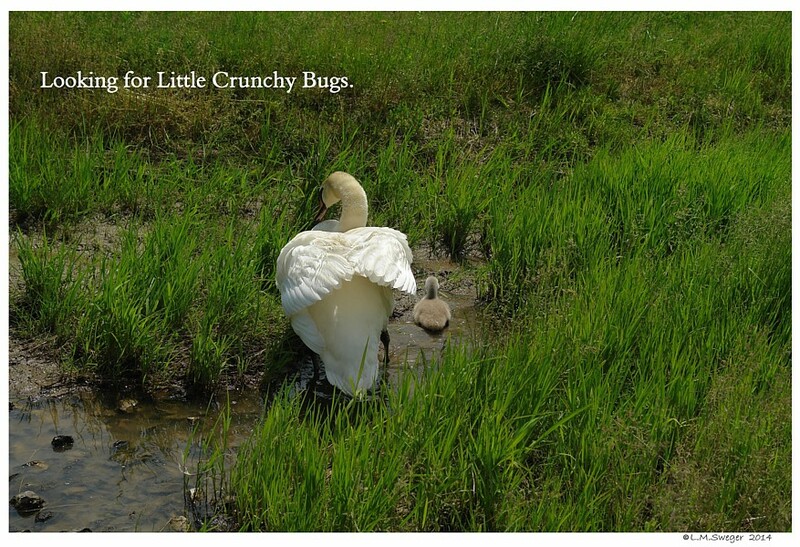 Precocial Birds find their own food, sometimes with help or instruction from the Parents. (the ability to regulate their own body temperatures), and they depend on the attending Parent(s) to brood them with body heat for a short period of time. 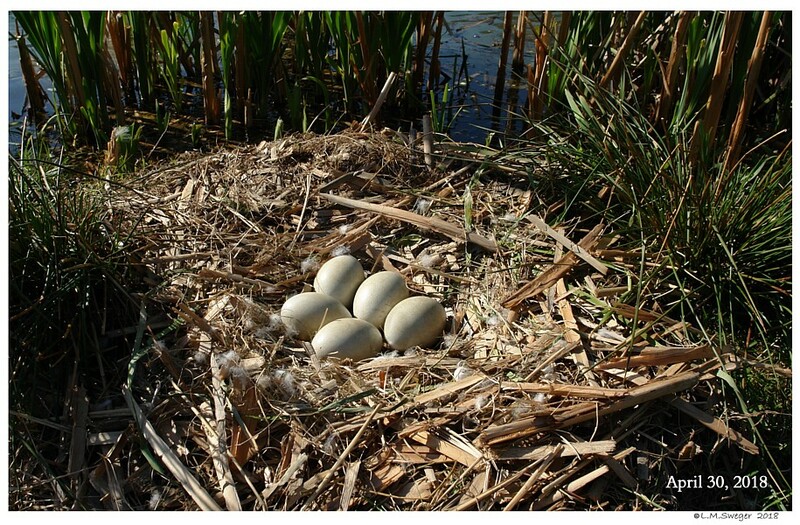 The Mute Swan Nest usually Matures in mid to late May. 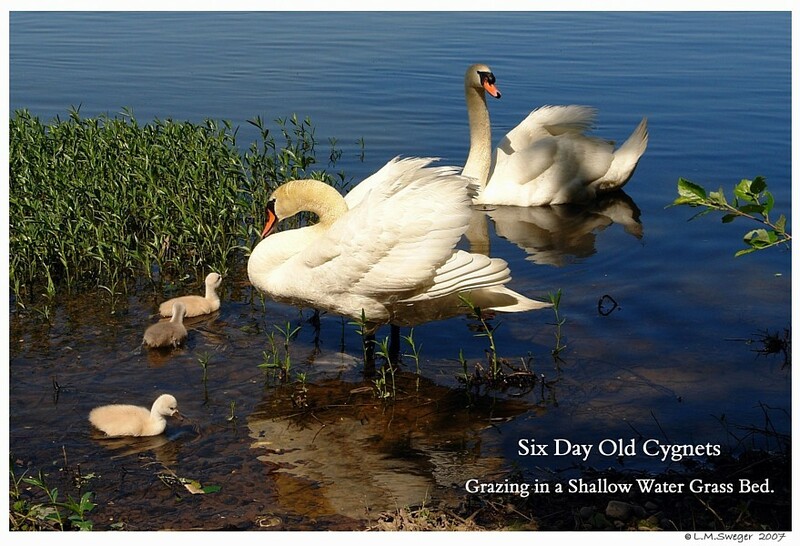 Mute Swan Parents normally take their tiny Downy Cygnets to the Water 12-36 hours after the last Cygnet has hatched. 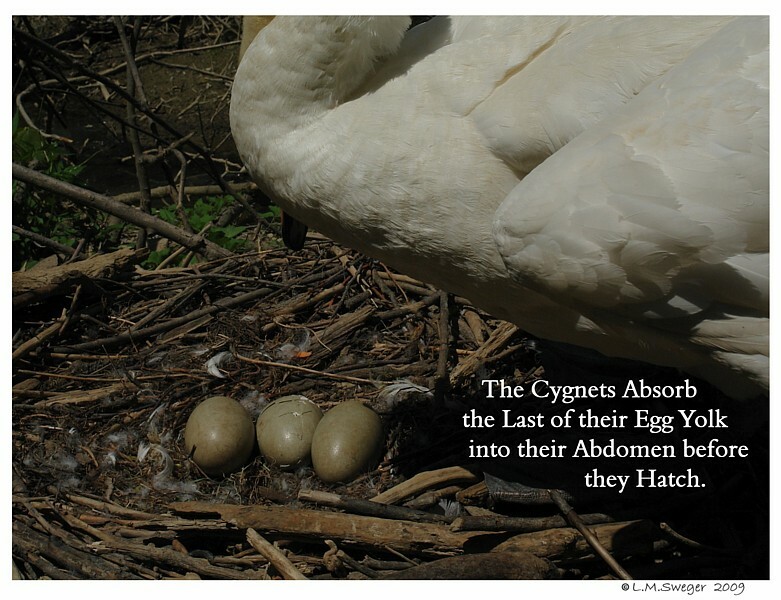 Just before the Swan Cygnets hatch, their body absorbs any remaining Egg Yolk material. The absorbed Yolk can sustains them for an average of three Days. 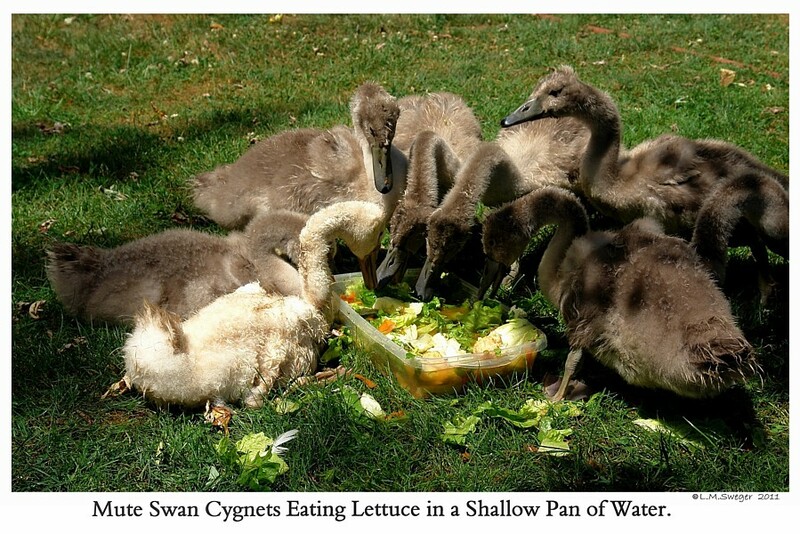 The Swan Parents do not feed their Cygnets. The Parents will check to be sure the Cygnets are waterproofed, floating and swimming properly before taking them beyond the water’s edge. They will take them further each time they enter the water. 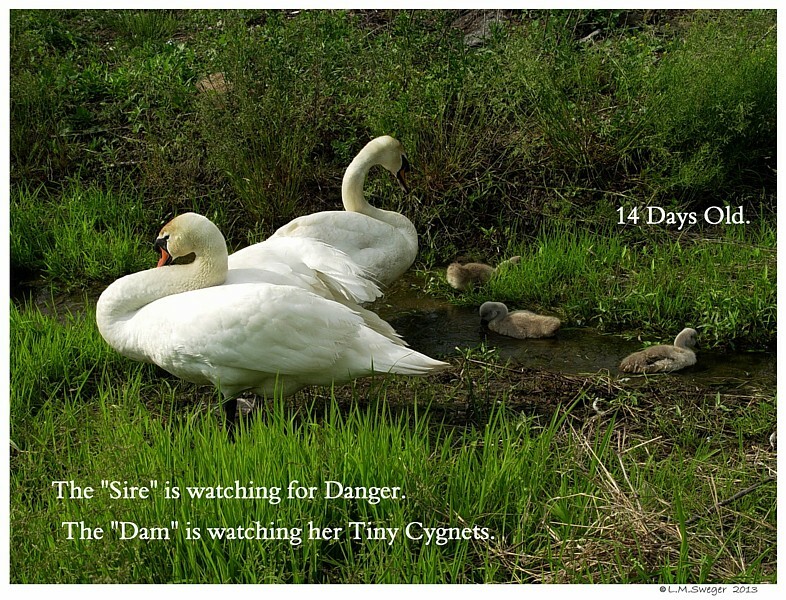 During the first few days, the Cygnets will be kept close to the Nest area. 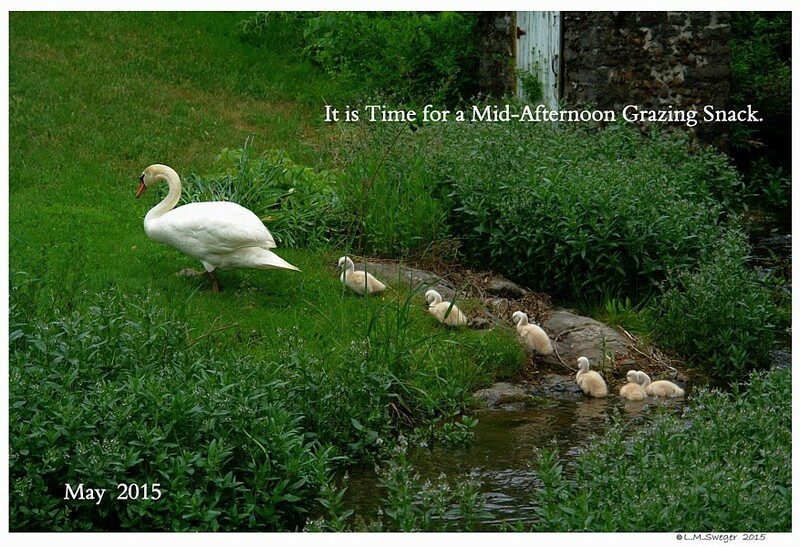 The Parents will take the Cygnets back to the Nest for Rest Periods and Naps. 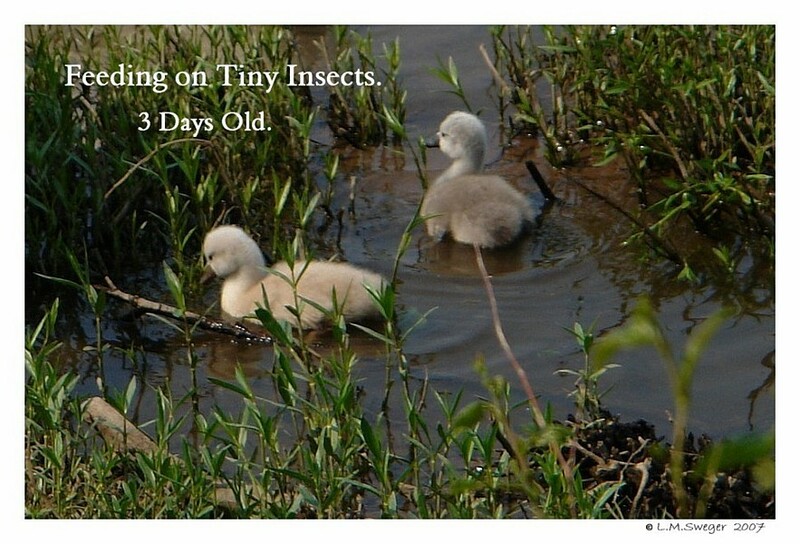 Swan Cygnets hatch during the time of year when there is normally an abundance of Insects along their Waterways. 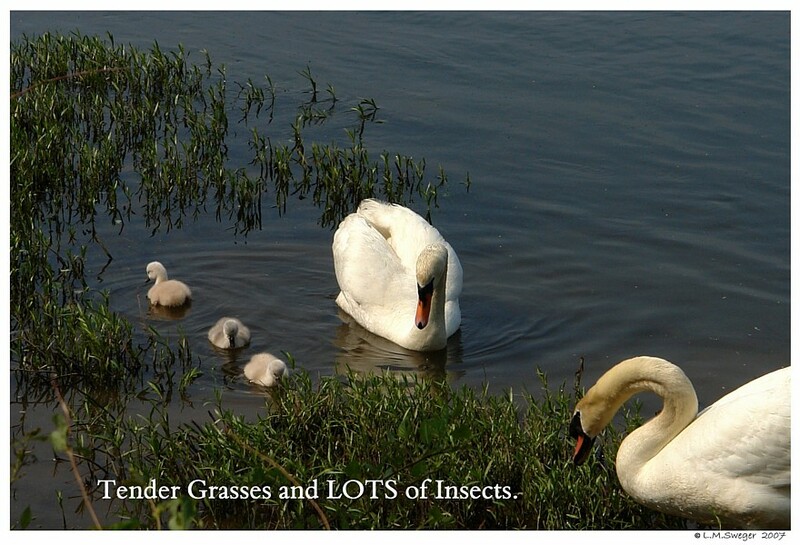 The Parent Swans will take their tiny Cygnets to graze in shallow areas where there are tender grasses and various young aquatic plants and LOTs of aquatic Insects, snails and other small invertebrates. 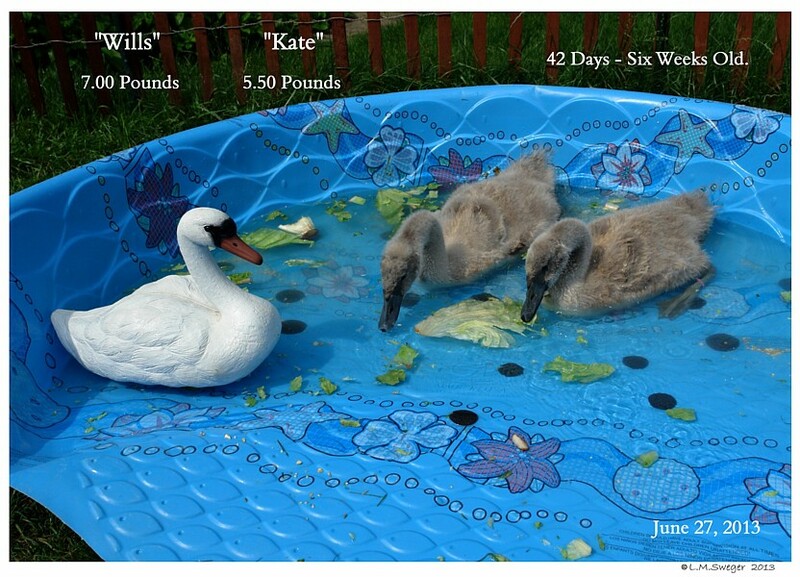 Swan Cygnets MUST “learn to eat” and eat well during their first 10 days. 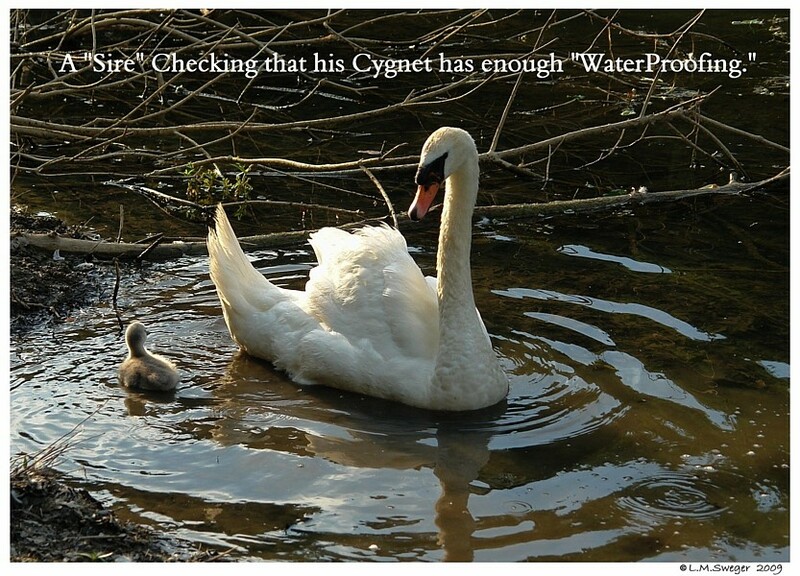 The Cygnet is Watching and Learning. 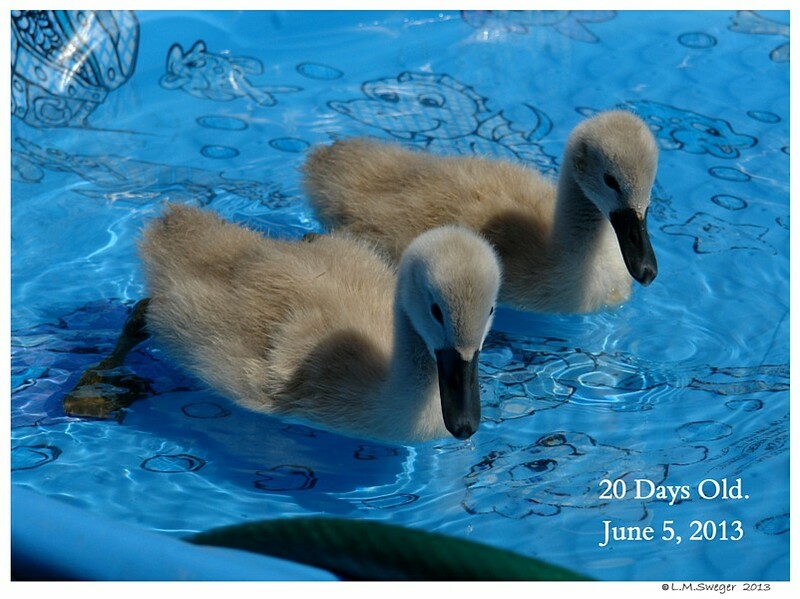 During the first several days up to day 10, the Cygnets need a higher Protein diet. 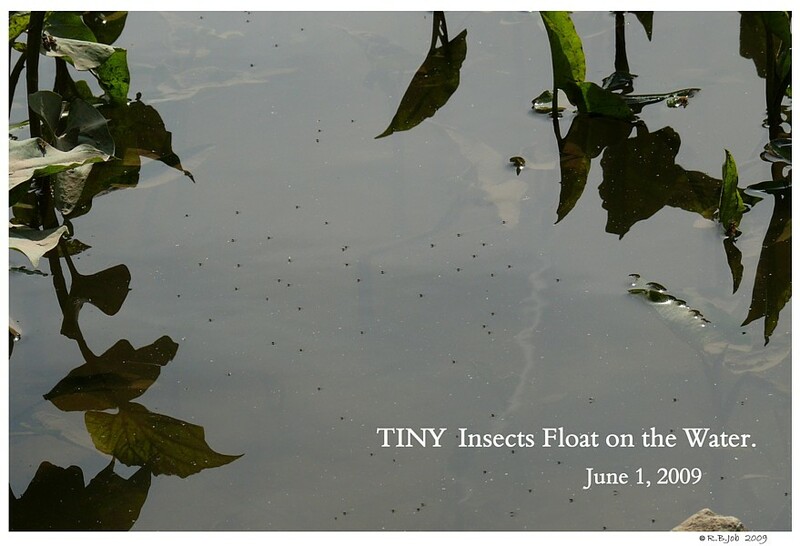 In a Natural setting they will consume many small Insects found in their Watery Environment. 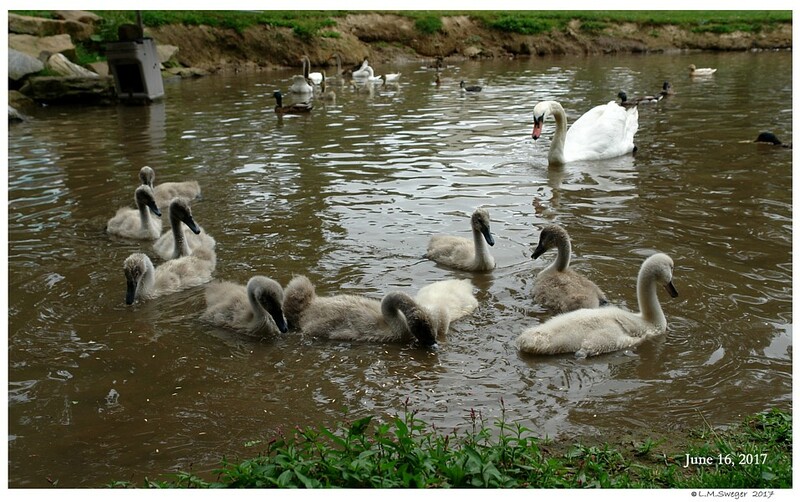 The Parent Swans will do their best to take their Cygnets to a location which will provide the Diet the Cygnets need. 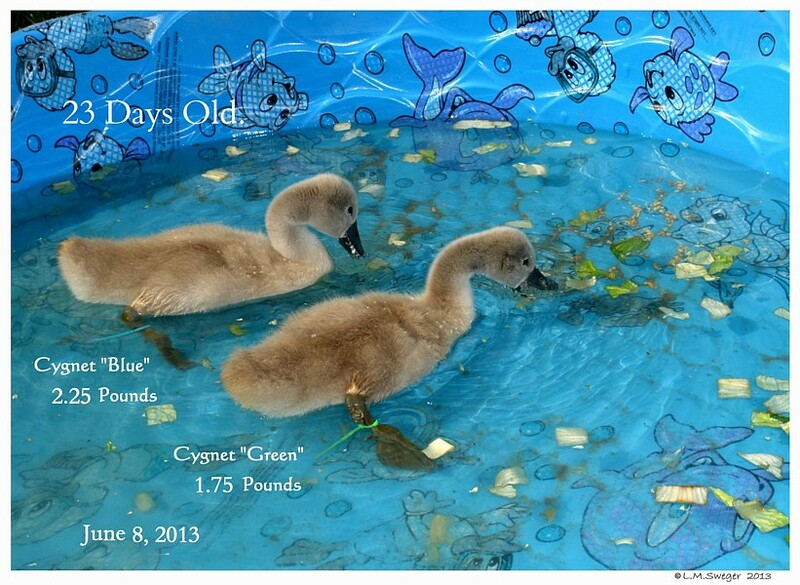 During the first 10 days, the Cygnets’ Protein need is higher then it will be for the rest of their lives. 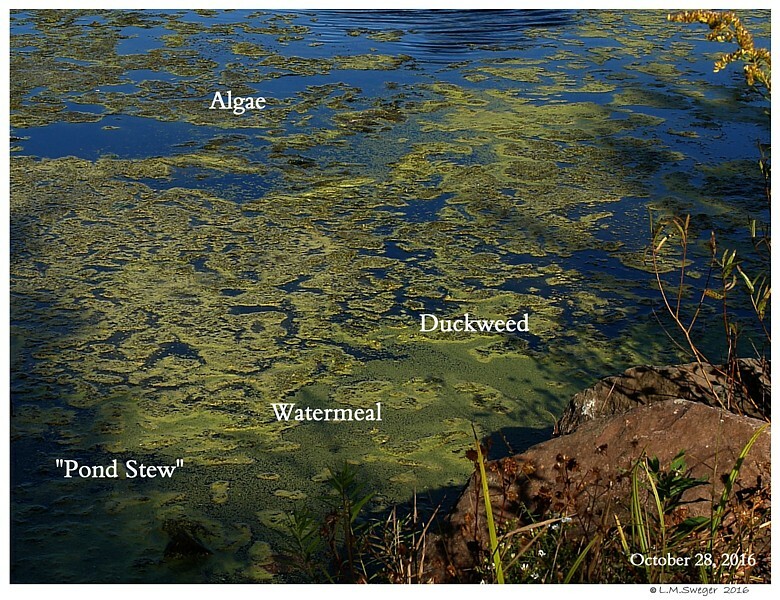 That is why the Insects and Underwater Critters are so important. The Swan Family will swim together in a line with one Parent at the front, the other Parent watching and protecting from the back of the line. 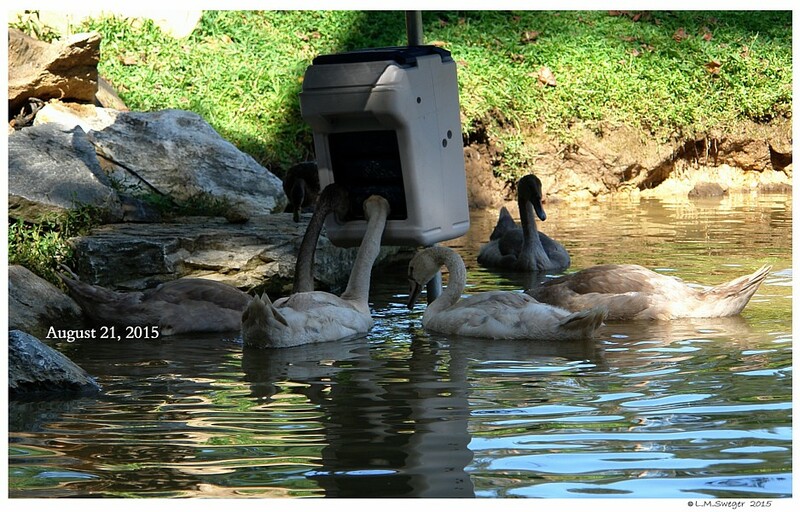 The “Dam”(Pen) may carry some of the young Cygnets on her back. 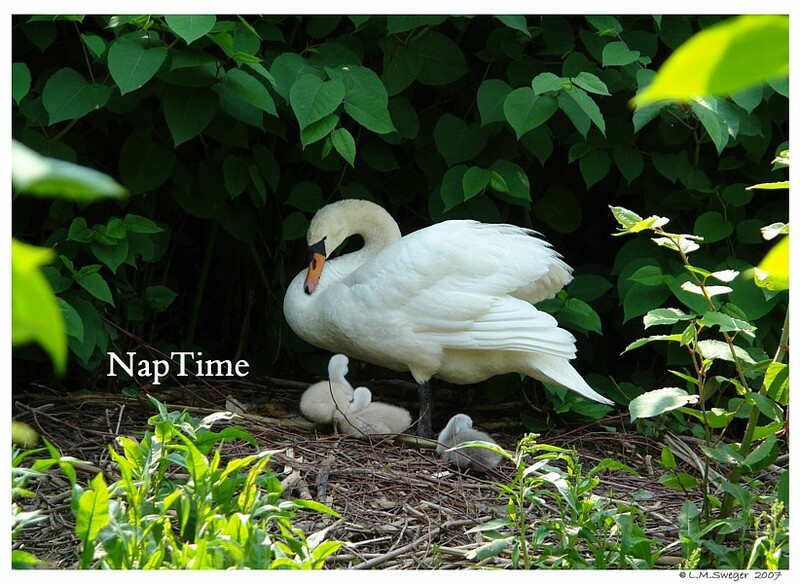 The Cygnets crawl up under her Wings and nestle in between and under her Wings. 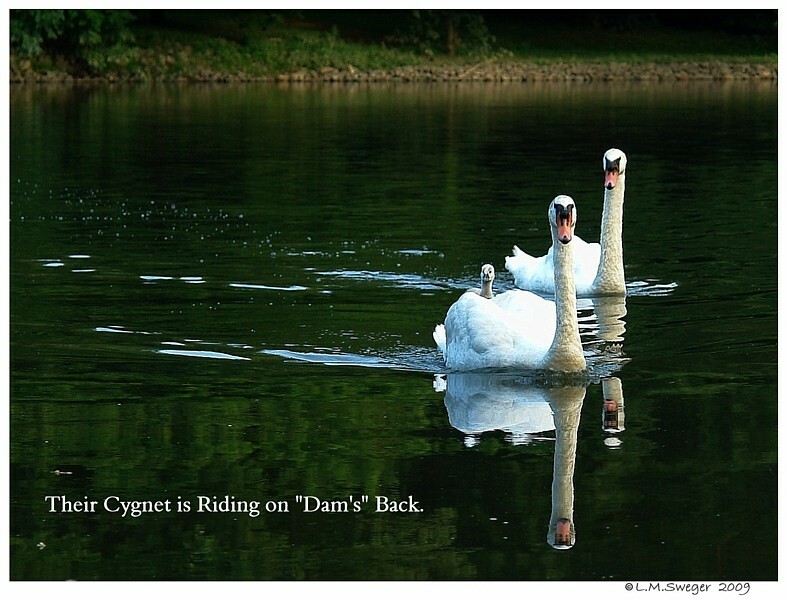 Some times the Cygnets will ride on their Parents’ backs. 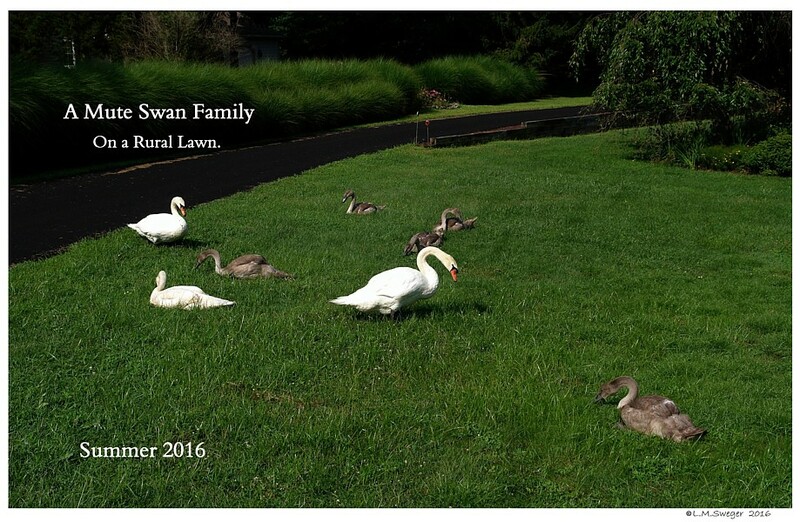 The Swan Family will be able to travel quickly. The Swan “Dam” will be VERY hungry after Nesting for Five LONG Weeks..
She will graze in shallow Waters with her Cygnets where there are lots of Insects in the Aquatic Plants. 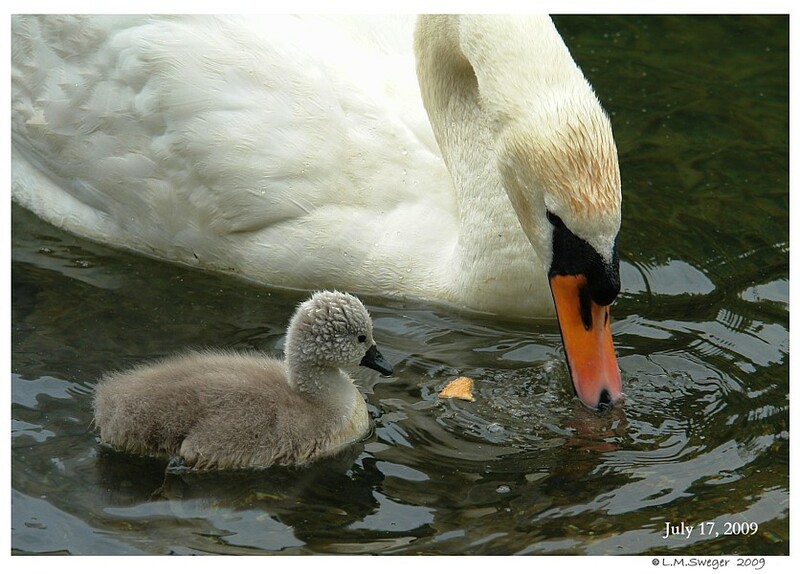 In Nature, the tiny Cygnets feed on the Water’s surface and depend on the Adults to stir up the Water around them. 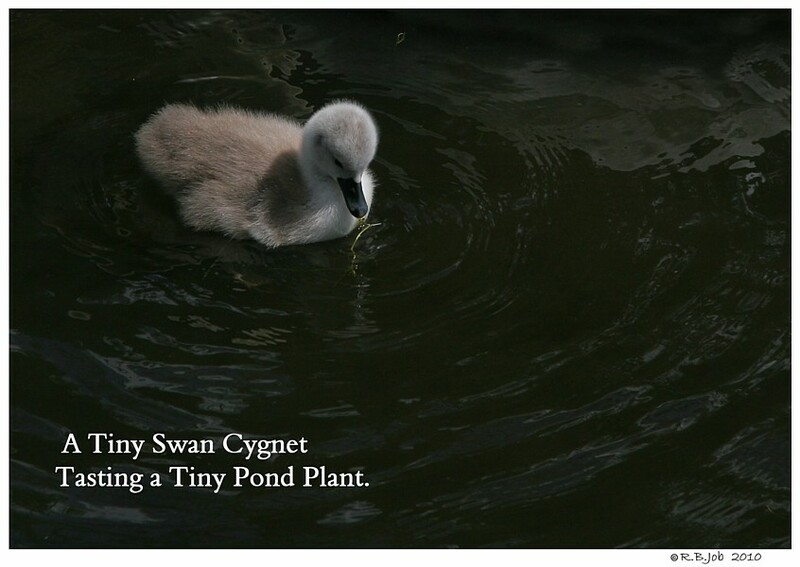 As the “Dam” pulls Plants to eat, she will dislodge many Nutrient Rich Pieces onto the Surface Water which the young Cygnets would otherwise be unable to reach. You may see the “Dam” “foot-pedaling” the Water with her feet to stir up the bottom to bring food bits to the surface for the Cygnets to graze on. One Parent will always be on guard as the Cygnets eat. Adequate Food is important the first year as their Bodies develop. 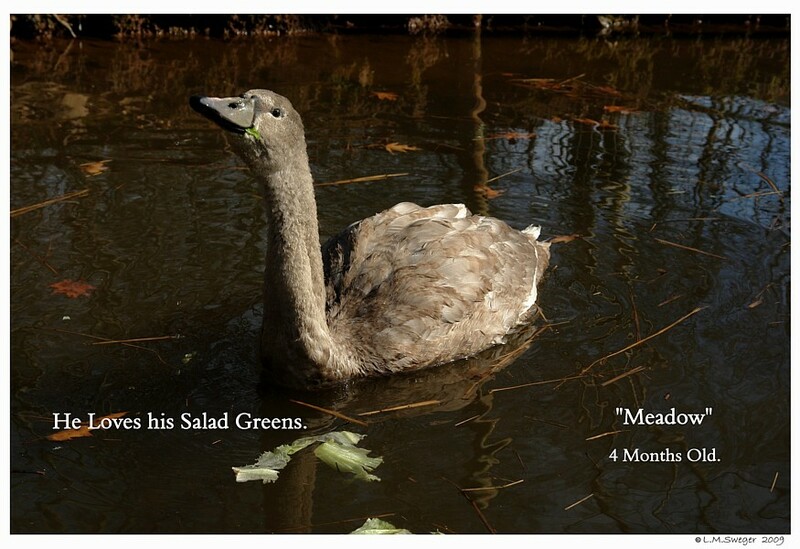 The First Three Month, Cygnet are Eating Machines. They Eat and POOP.. Eat and Poop… Lots of Poop. If their Diet is poor and insufficient they may not survive. Without a Diet that contains adequate Calcium, their Legs may bow, twist a bit, even break with little pressure. 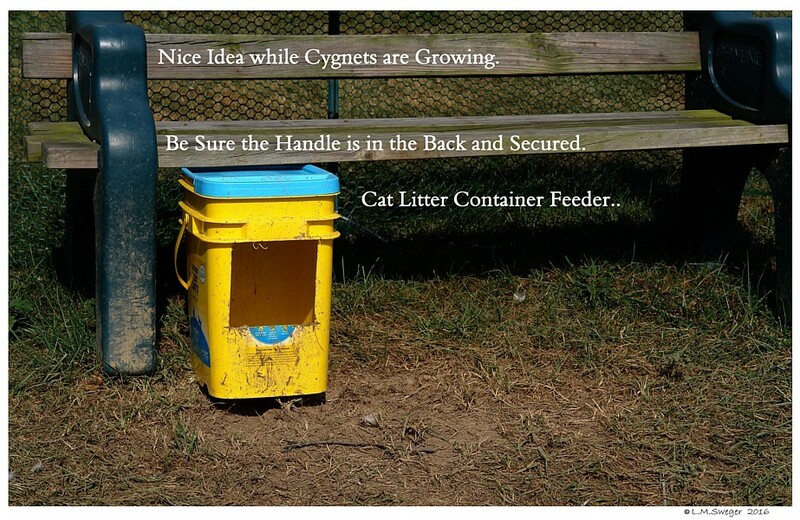 Handle the Cygnets very gently… Pick-up Carefully… Set Down GENTLY ! 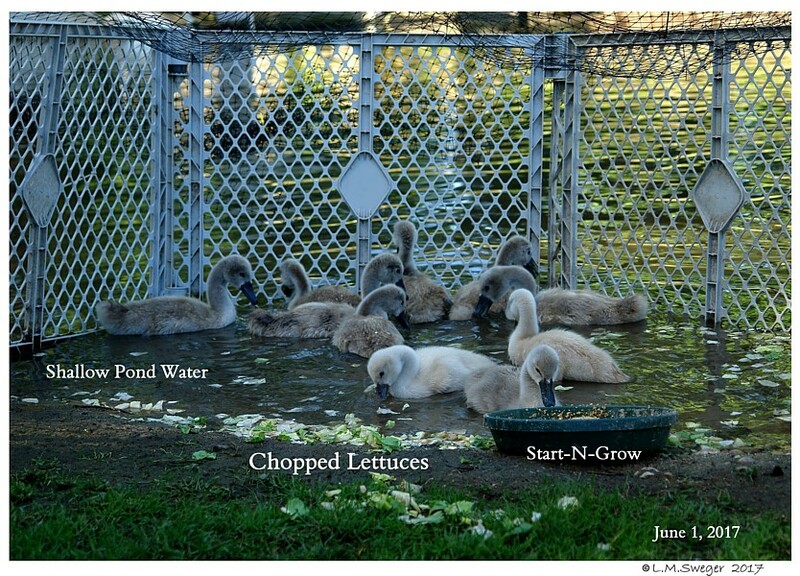 The First Week, Cygnets will eat some finely Chopped Romaine Lettuce, finely Grated Carrot and a little Chopped Spinach floating on the Water. 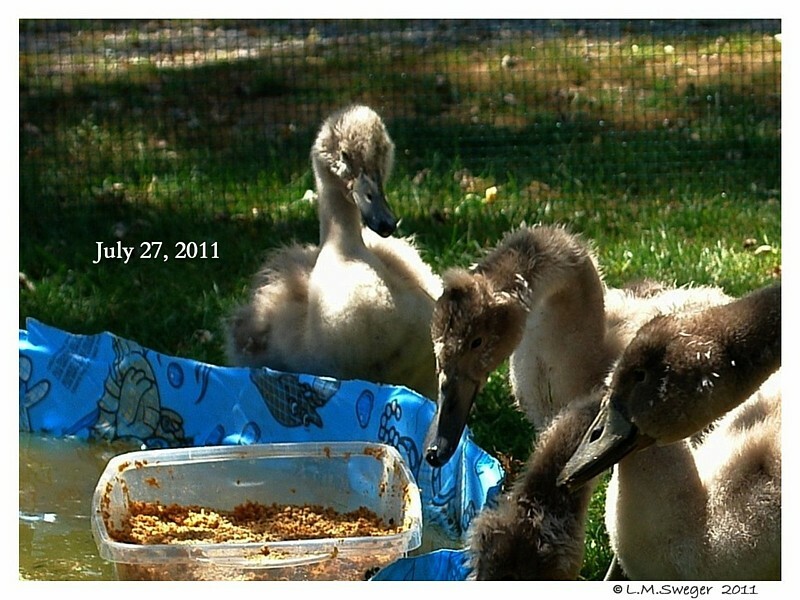 At about a Week Old the Cygnets will eat a little Scratch Feed (Corn-Wheat) floated on the Water. 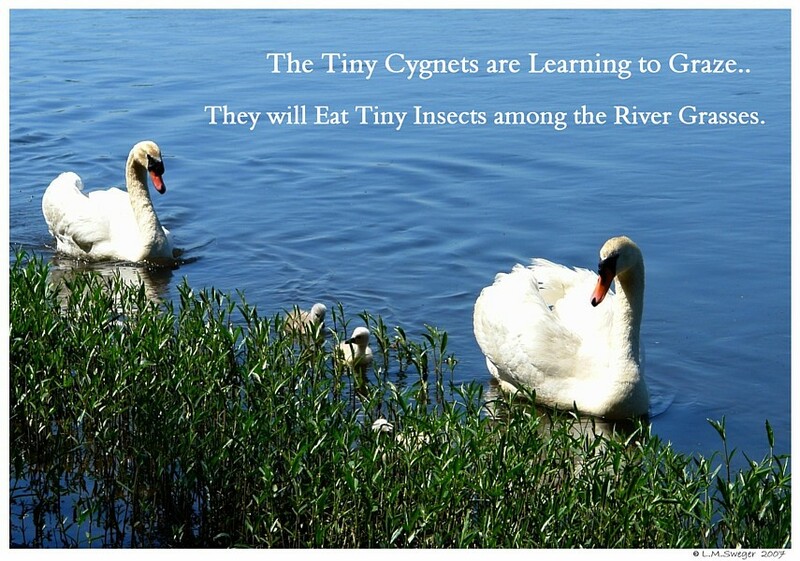 Soon, the Cygnets will be able to peck at Water Plants and Insects on their own. 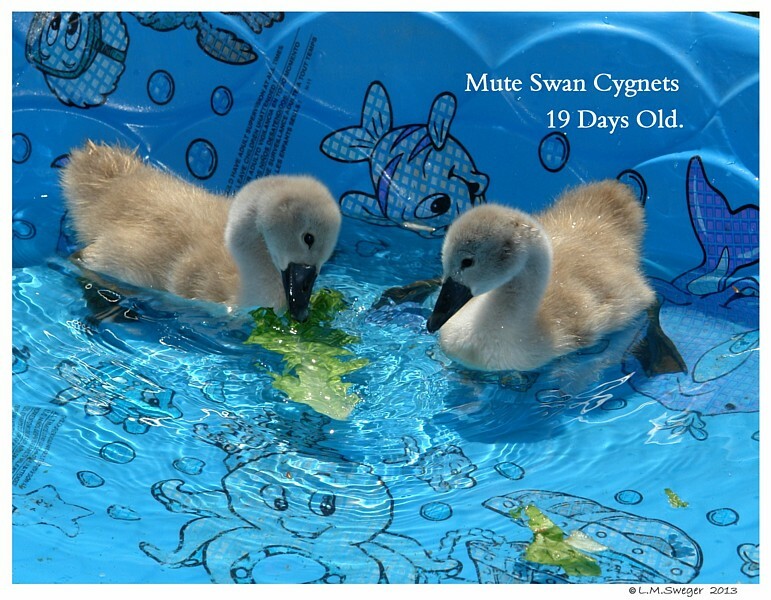 Within 2 to 3 weeks the Cygnets start to eat Aquatic Plants. You will see them start to “up-end” and eat from below the Water’s surface. 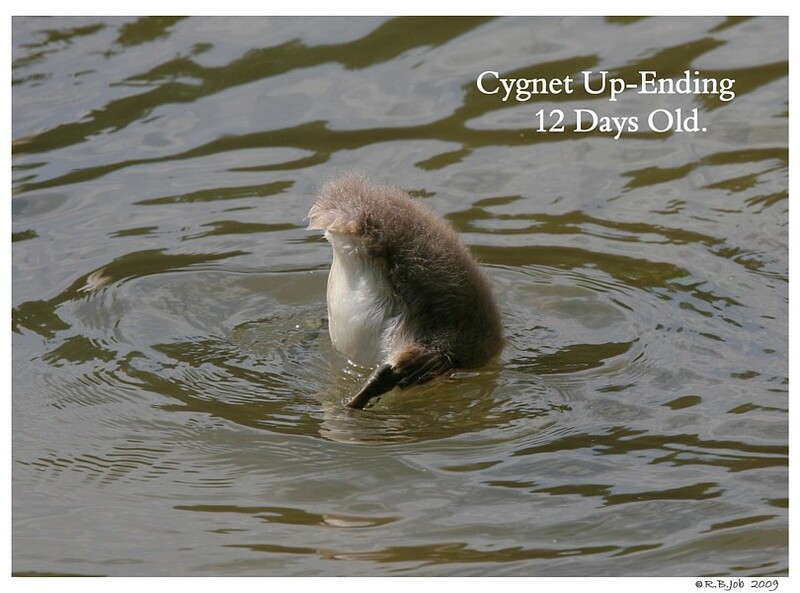 The Cygnets need a diet rich in Protein and Calcium for their first two to six weeks. 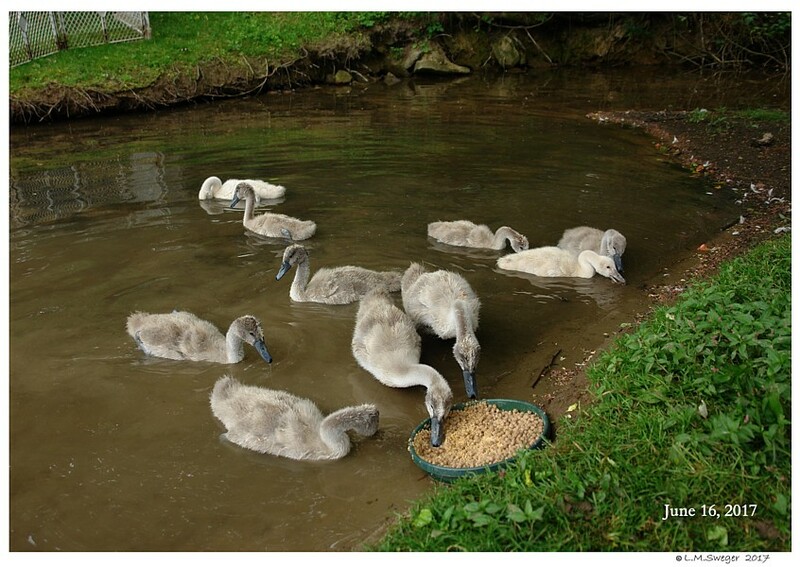 If you are Hand Raising Cygnets – A Sprinkle of Dried Meal Worms is a GREAT Source of Protein and a TREAT ! 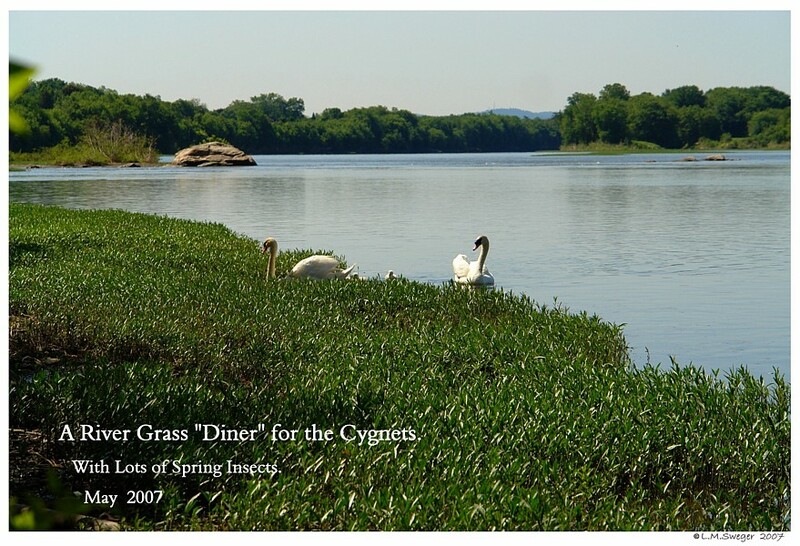 The Cygnets’ Diet will gradually change to more Plant Material. 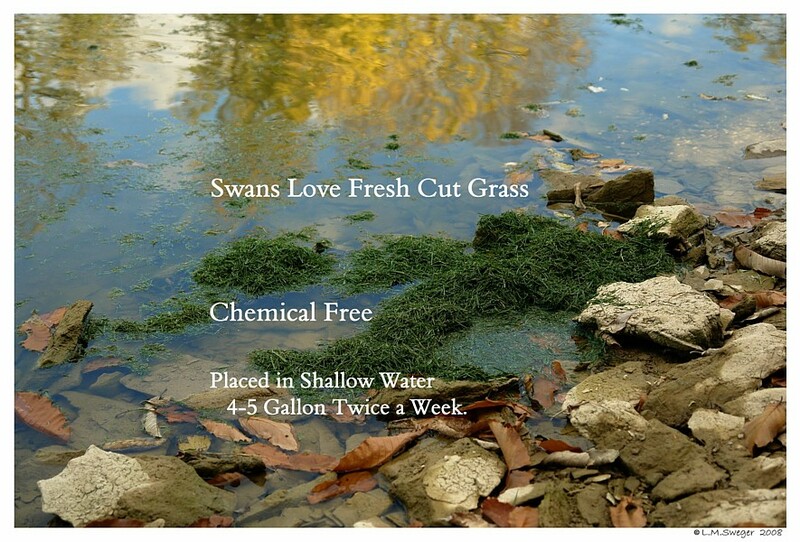 Swans living in Fresh Waters will typically eat pondweed, stonewort and wigeon grass, as well as tadpoles and insects such as milfoil. 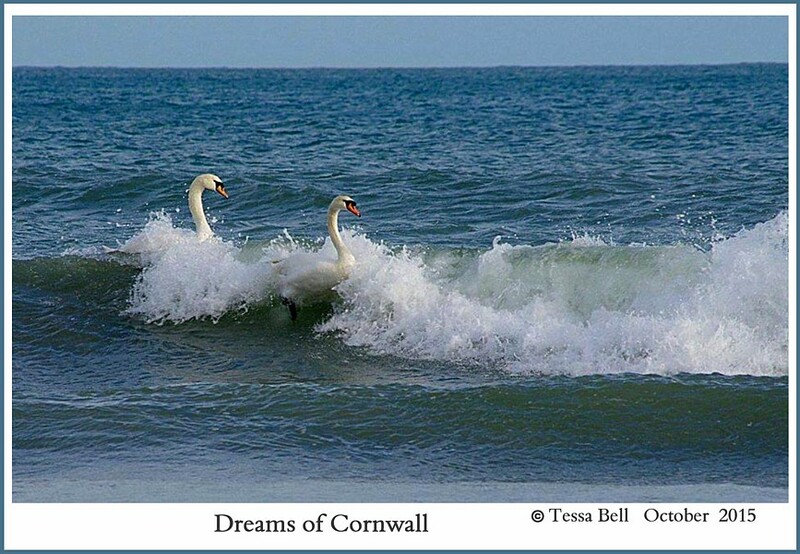 Swans living in salty Waters will typically eat sea arrow grass, salt marsh grass, eel grass, club rush and green algae, as well as insects and molluscs. it is a Good Idea to do a Search for REVIEWs, Recalls.. and other Problems the Manufacturer of these Products have had. Even Brand Names have Quality Control Failures. 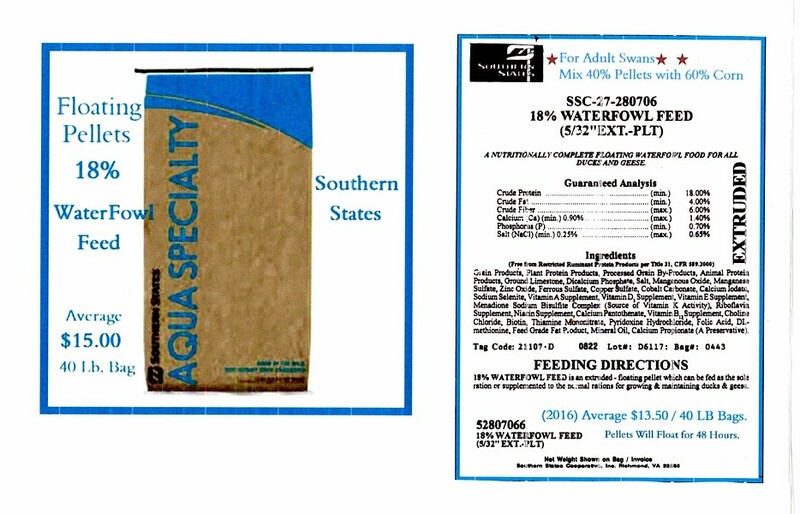 ASK Your Feed Supplier if they know of any Problems with Feed Products. 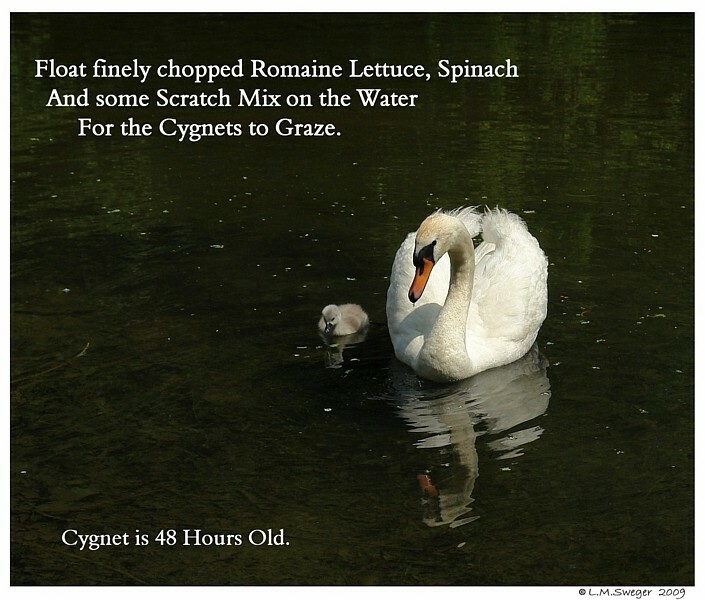 Put these early Cygnet Foods in or VERY close to the Water. DO NOT LET FEED SOUR. Feed/Mixture Sours quickly on Warm Days. 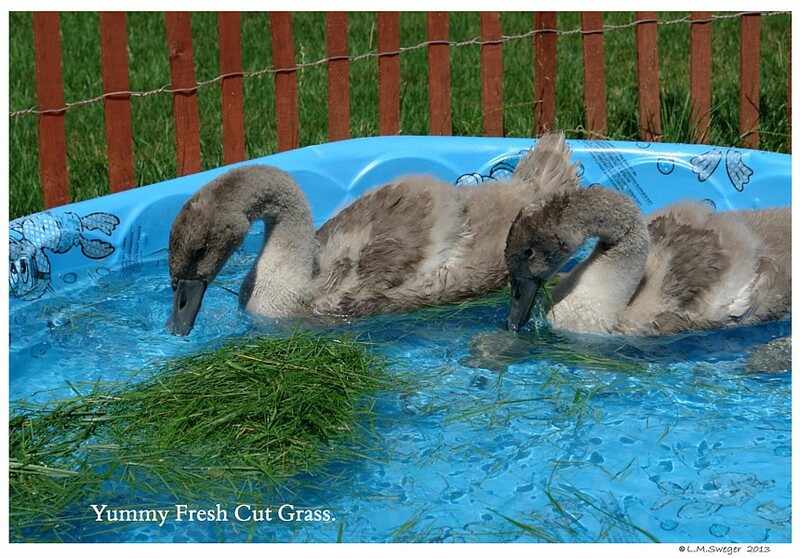 Cygnets will be eating these “Baby Swan Foods” during Warm Weather. 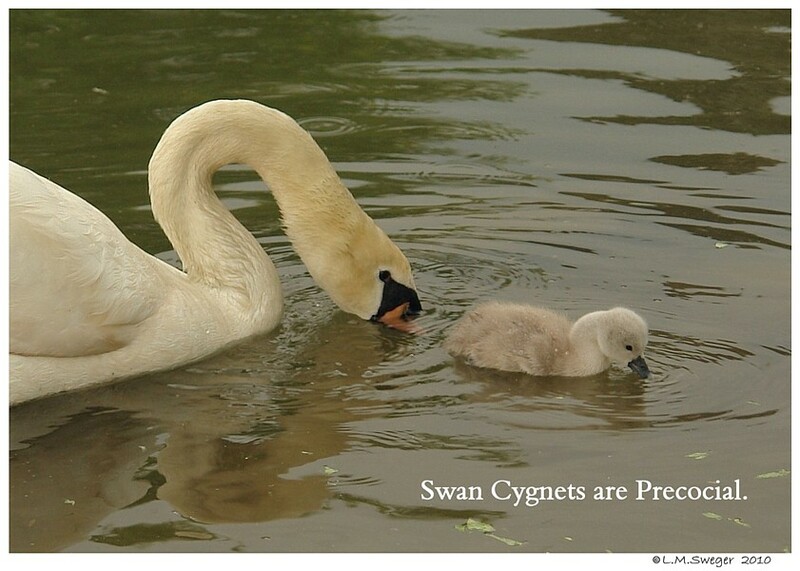 For VERY Small Cygnets use a Low Saucer or Dish..
To Keep the Cygnets from Standing or Swimming in their Feed Dish.. place a Weighted Container in the Center of the Saucer. Mix Feed with Water to the Consistency of Thin Oatmeal. 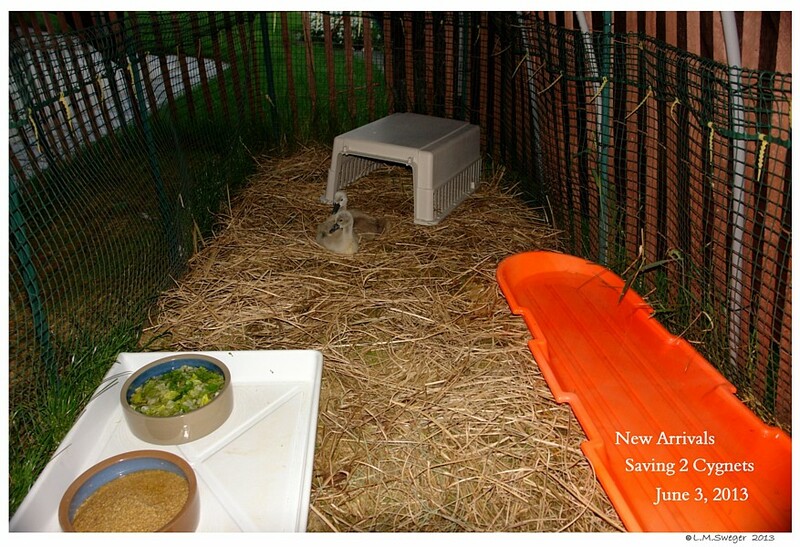 Take care to keep their Food in the Shade if possible to reduce Spoiling. 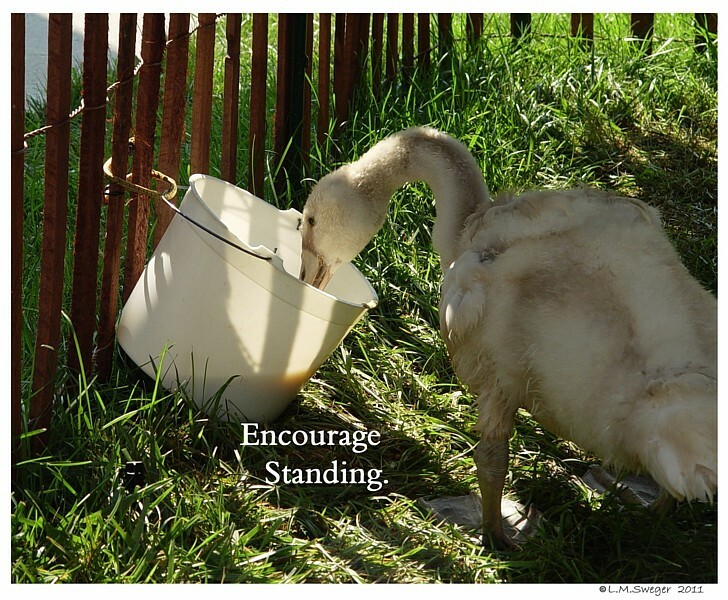 Putting their Feed in Containers that encourage them to stand may help to strengthen their legs. Not Too High. 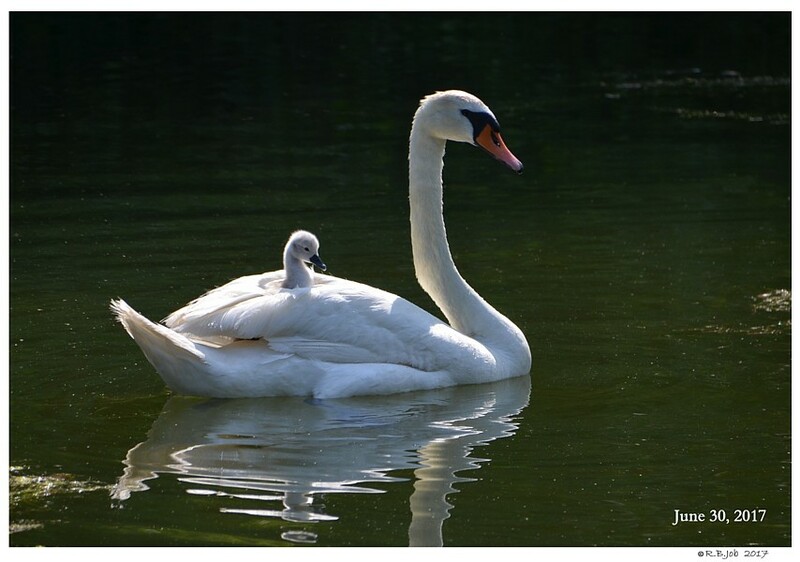 It is well know that Swan Cygnet tend to have weak Leg Bones. Most Birds have bones that are structurally very light. You will need to be very gentle if you want to pick up the young Cygnets. 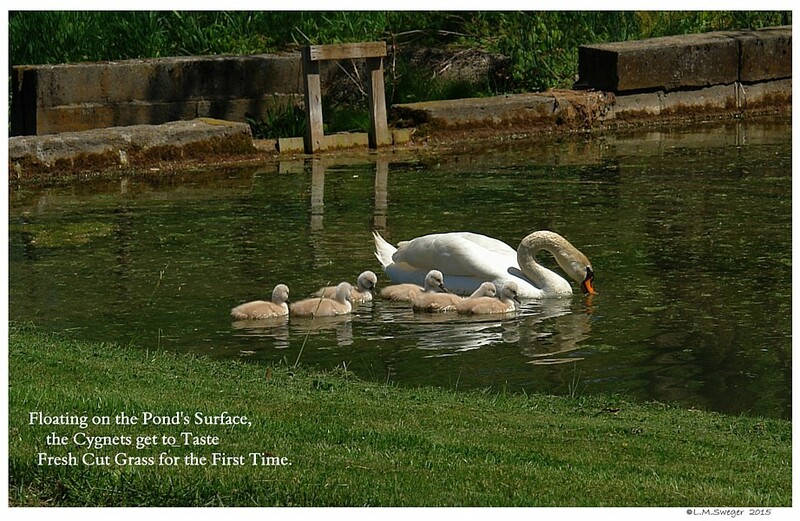 Cygnets need to be out in the SunShine ***when and where safe… Growing Bones need SunShine/Vitamin D to prevent Rickets/weak Bones. Proper Commercial Feed will help. They Prevent Vitamin D Deficiency. 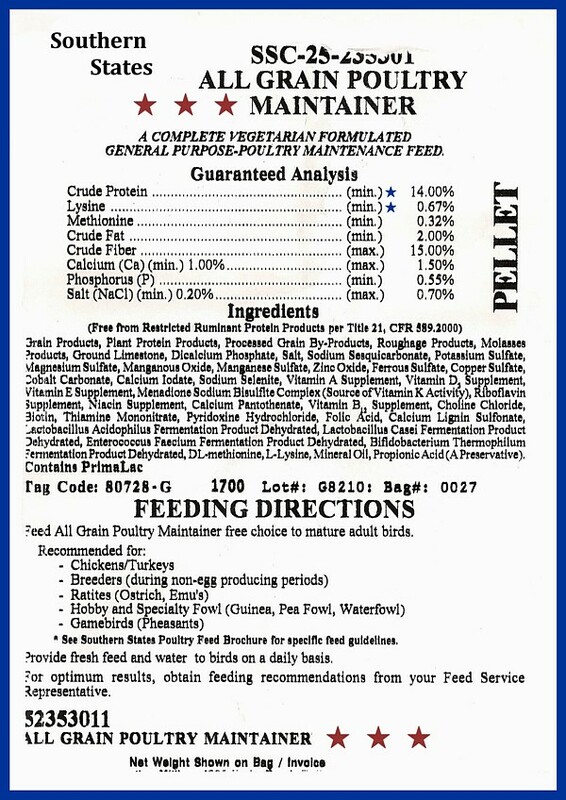 The Added Vitamins in these Feeds will help prevent various Health Problems. 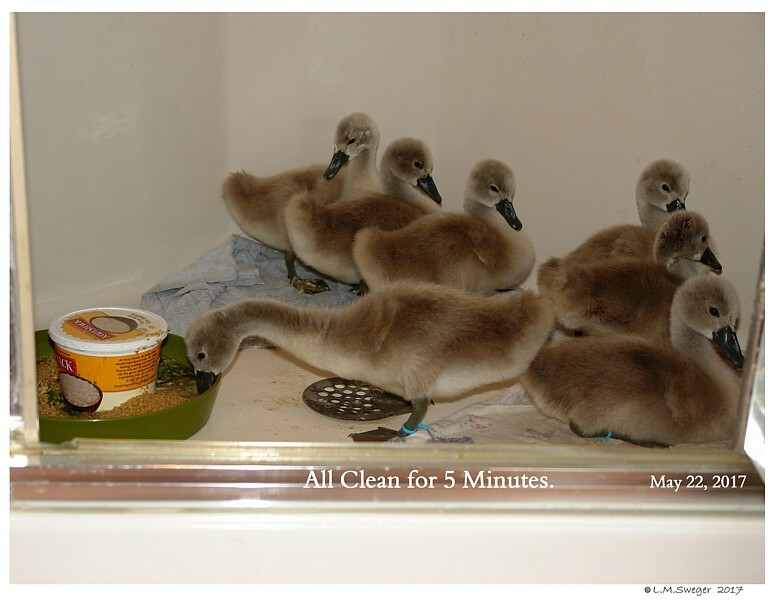 Cygnets need to be able to Swim/Wash each day, to Clean and to Preen which is needed for their WaterProofing. 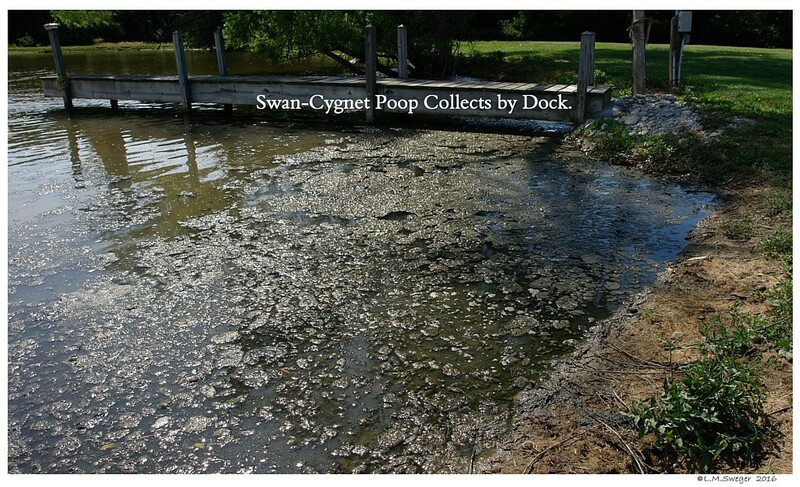 These Commercial Feeds contains Antibiotics which will INCREASE SWAN CYGNET MORTALITY. The Antibiotic reduces the Natural Bacteria in their Gut. 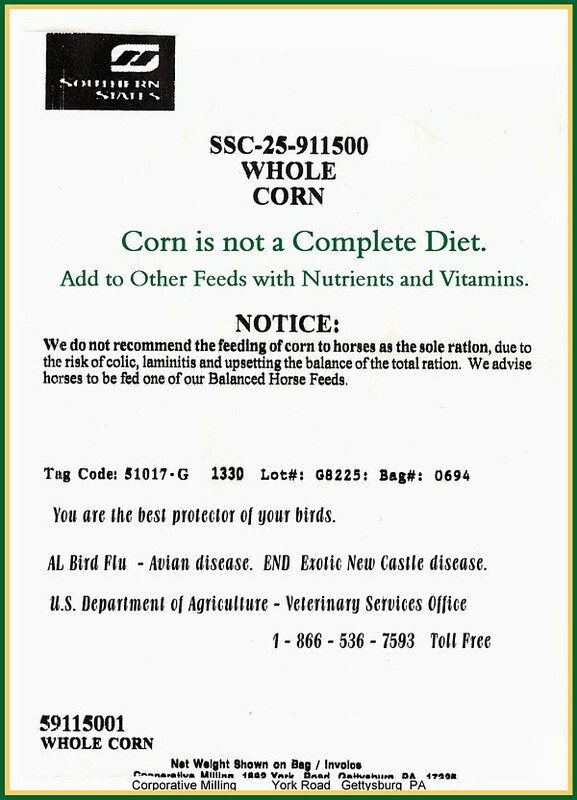 IF you are Unsure what Feed or Schedule to choose, CHECK with your Avian Veterinarian..
Or your STATE’s Department of Agriculture Avian/Poultry Specialists. 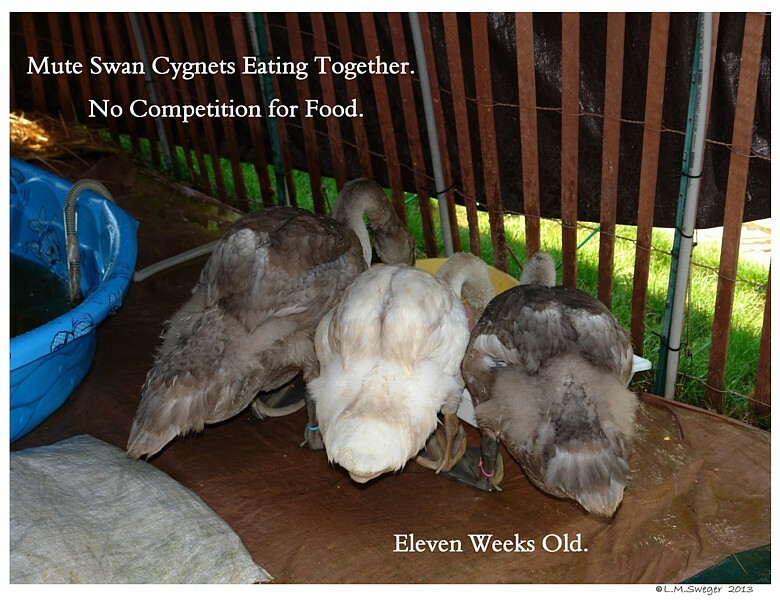 Your Cygnets will have a healthier start in life if they get proper Nutrition. In the Wild, Swans would have a range of 3 to 5 square miles to seek all the food items that they require for general health. 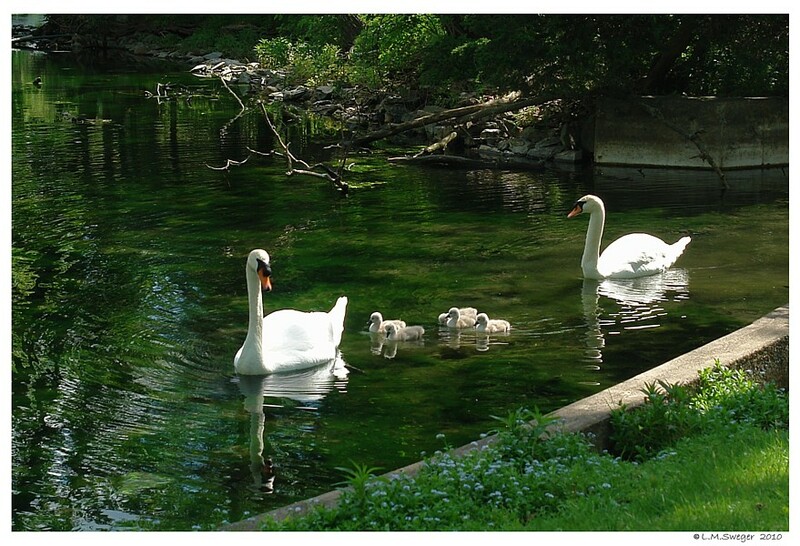 As the Cygnets grow, these Parents will take them to find and eat a wide variety of Natural Foods. 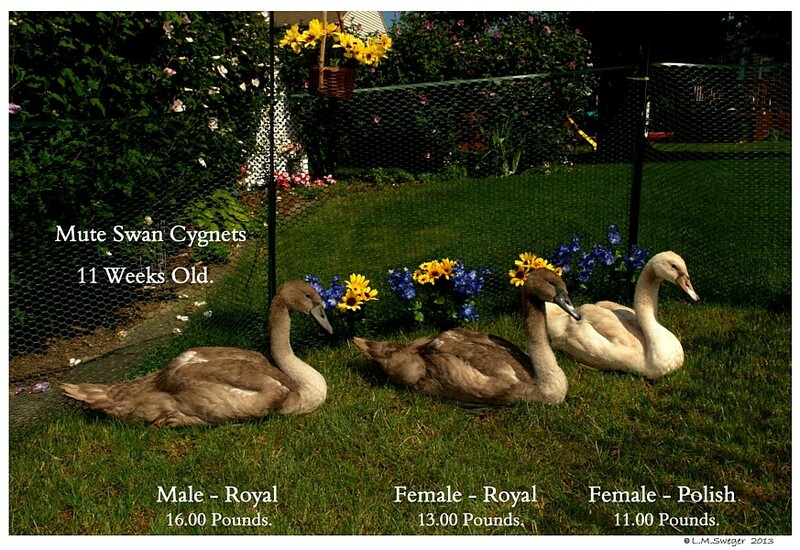 Captive Swan Parents will need you to evaluate their environment and supplement nutrition to aid healthy growth of their Tiny Cygnets. 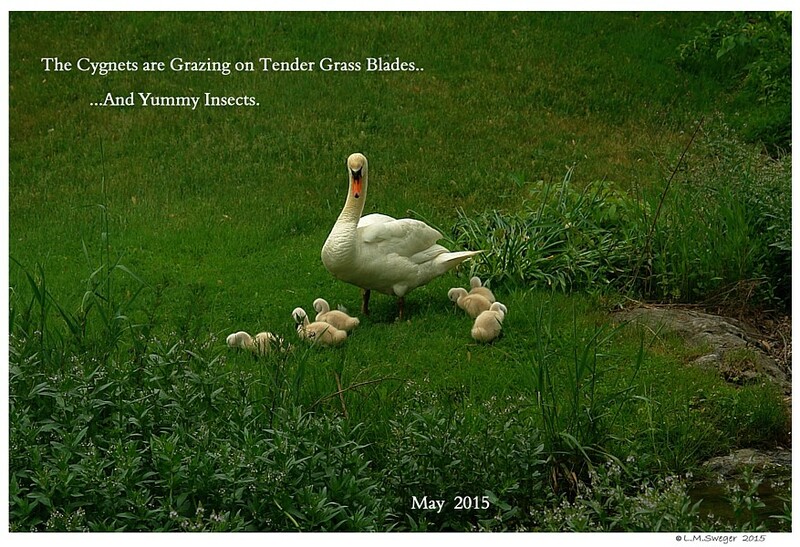 Swans enjoy grazing on tender grass blades.. not too short.. 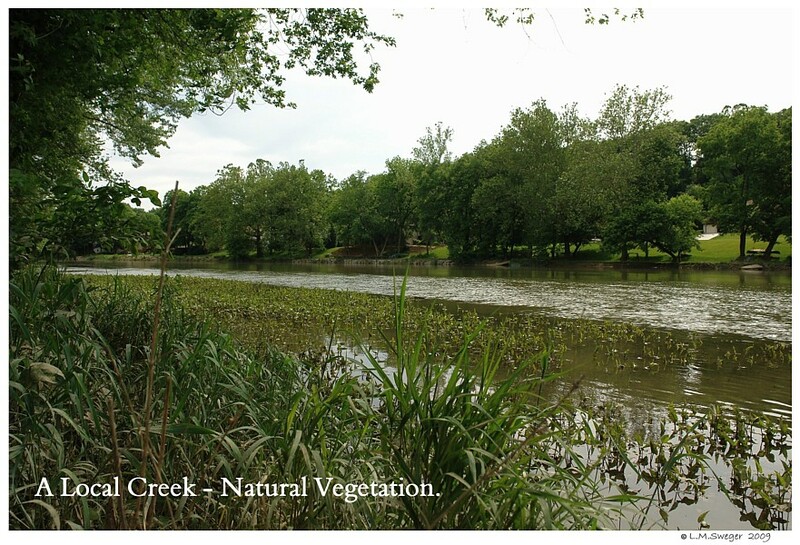 When you Mow around the Water’s Edge, try not to cut your Lawn so short. 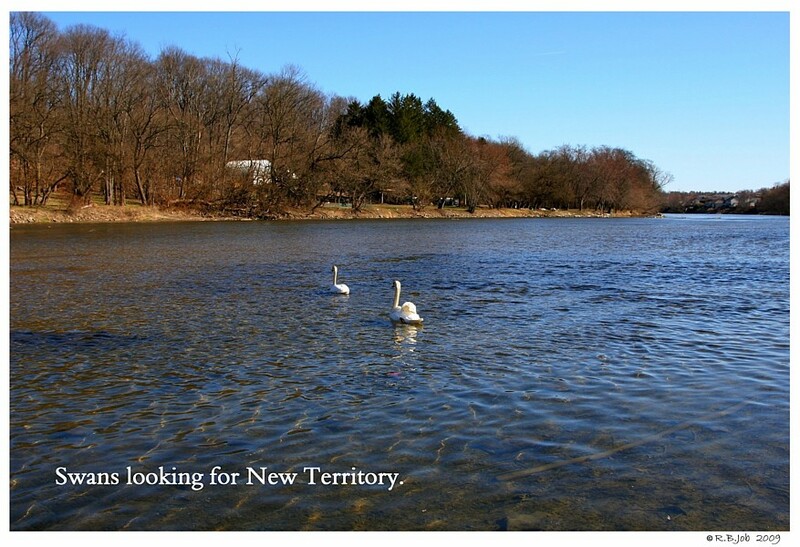 Allow some new tender growth for the Swans to Graze. Fresh Cut Grass floating on the Pond is a Welcome Treat. 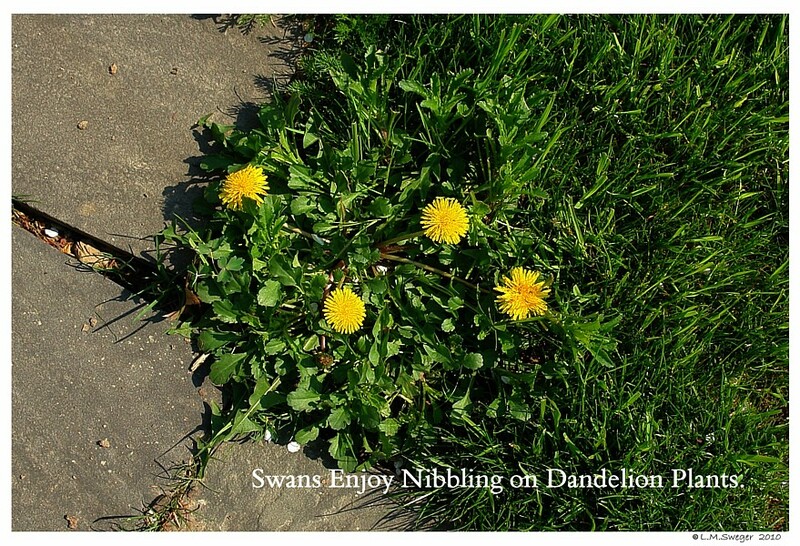 Swans will nibble on the Flowers and Leaves of Dandelion Plants. 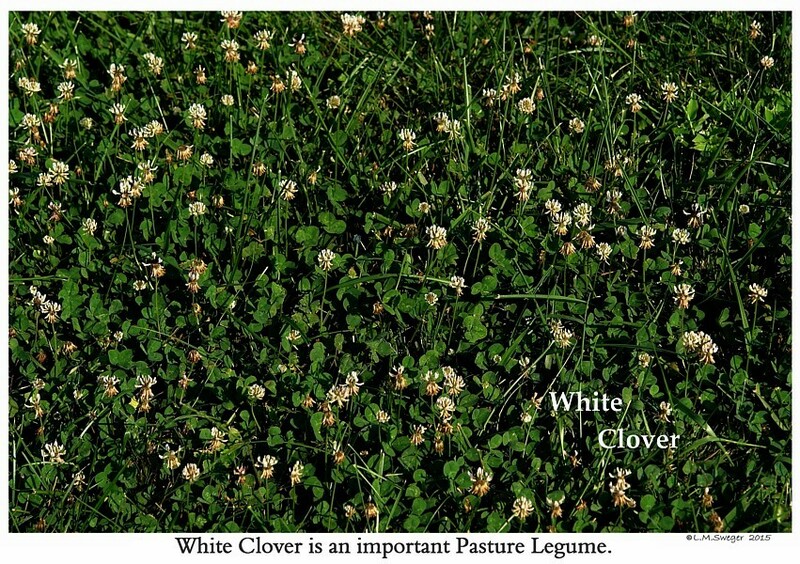 A Patch of lush Clover is a Tasty Treat. Below is a Suggested Feed Schedule. *START-N-GROW* if this is available…. One 25 lbs. Bag should be plenty for a Brood of 6-8 Cygnets. 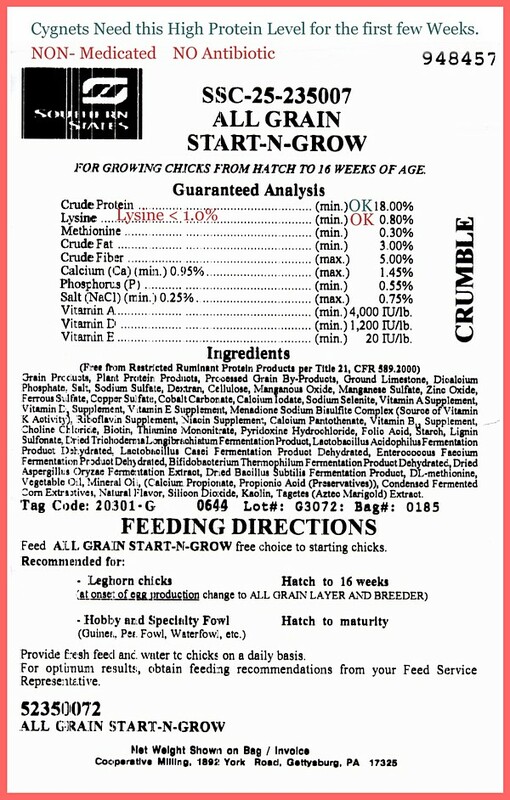 Crumble (Specialty Poultry Feed) ****UNMEDICATED…. 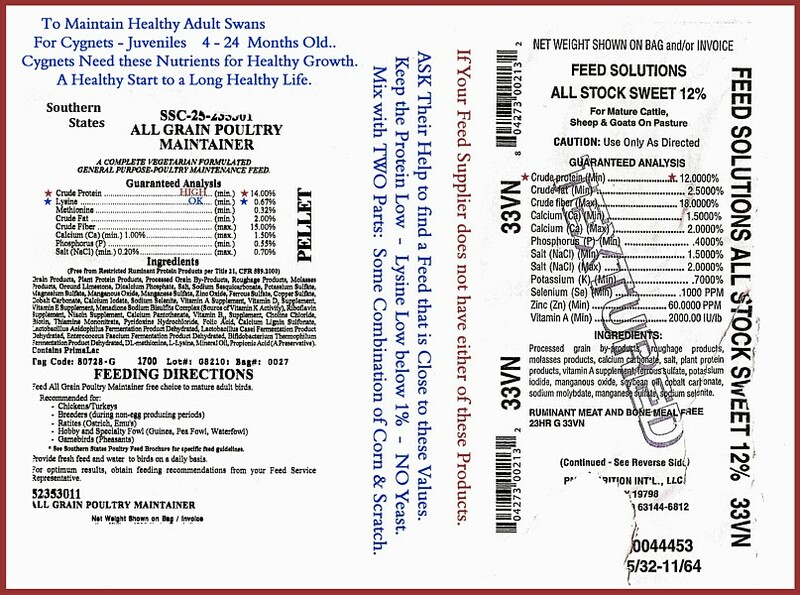 *Crude Protein 16-18% Avoid the Higher Protein Feed. 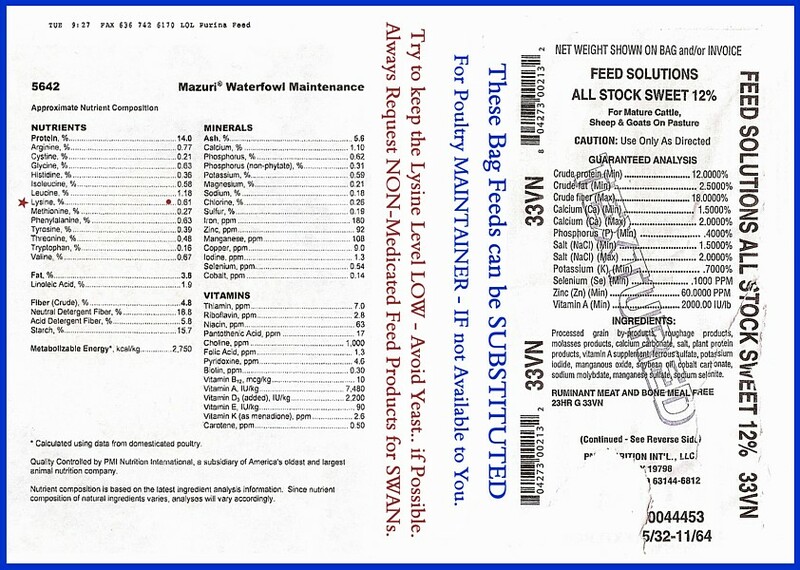 *Lysine 0.75% Avoid the Higher Lysine Feed. This is VERY Important for the Development of Strong Bones. ** IF this is unavailable try for the closest formulation. Ask your Feed Representative for help selecting the closest match. *** Hand Raised Cygnets need a Supply of fine Grit..
Add about a Teaspoon to each Quart of Feed. Place the “START-N-GROW”/Crumble in a Shallow Pan. 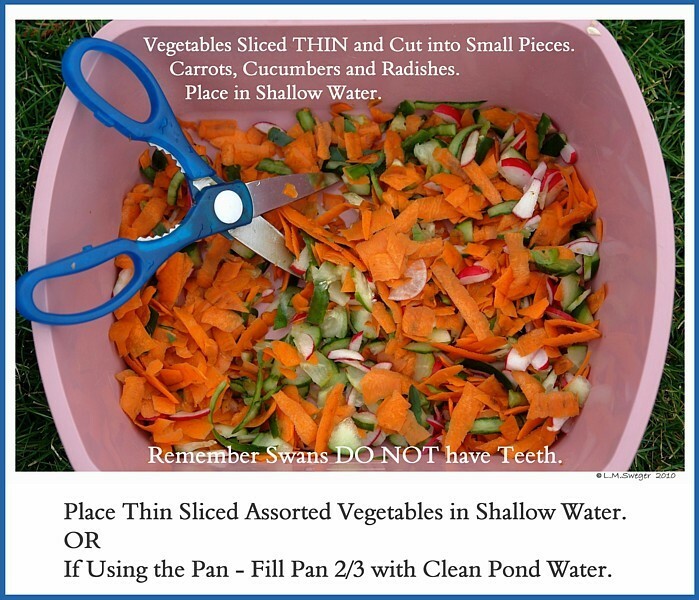 Add enough FRESH Water to Cover. It should look like wet Oatmeal. ** If Possible place in a Cool Shaded Location in shallow Water. 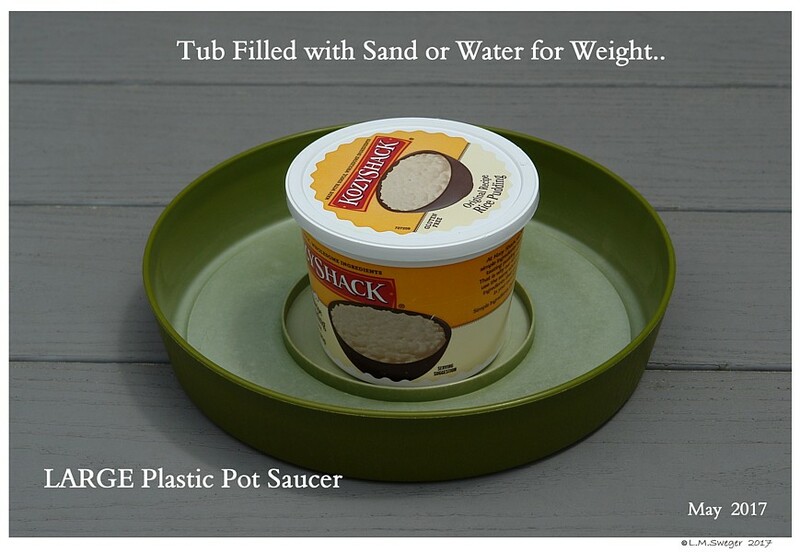 the Pan from floating out into the Water out of your reach. you may need to clean and change the Feed Pan at least twice. ***DO NOT LET THE FEED SOUR.. SMELL STRONG or START TO BUBBLE. 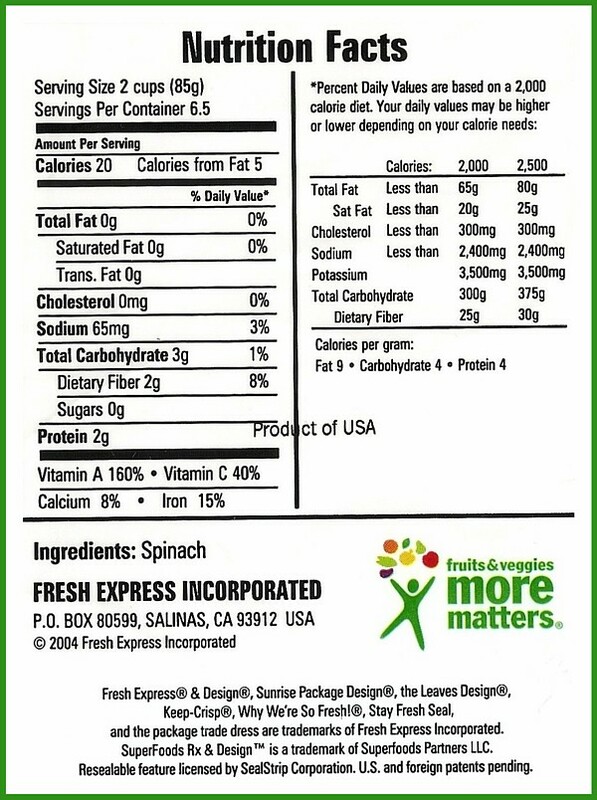 Sprinkle Feed Pan with finely chopped Romaine/Dark Curly Leaf Lettuces, Spinach. Dark Greens are good for them until they are able to graze for themselves. 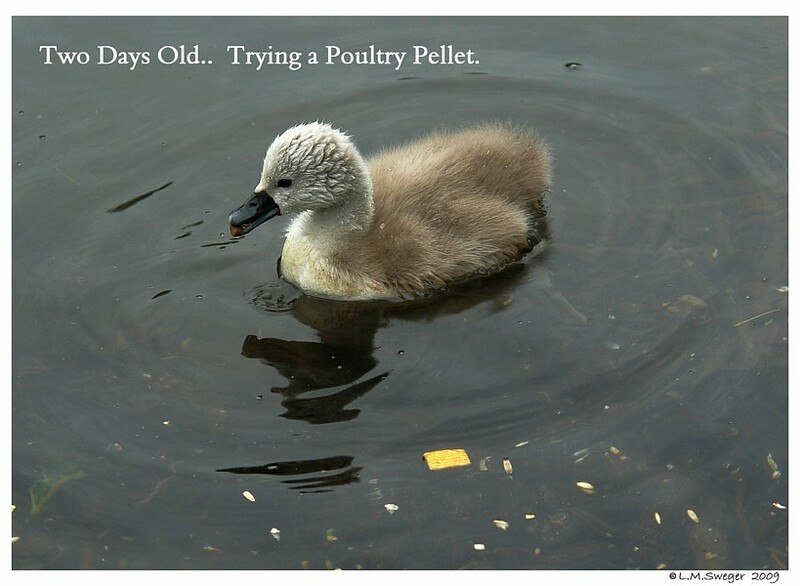 If the Cygnets are on your Pond or Lake – You might try tossing small amounts of their Feed onto clean shallow Water several times a day, so they can swallow Water with the Feed. Unsound and Encourages the Swans/Cygnets to leave the Water whenever they see People. This may bring them into harms way from Cars, Lawn Mowers, Dogs, Predators, People, etc. Swans are *Safest* in their Water. 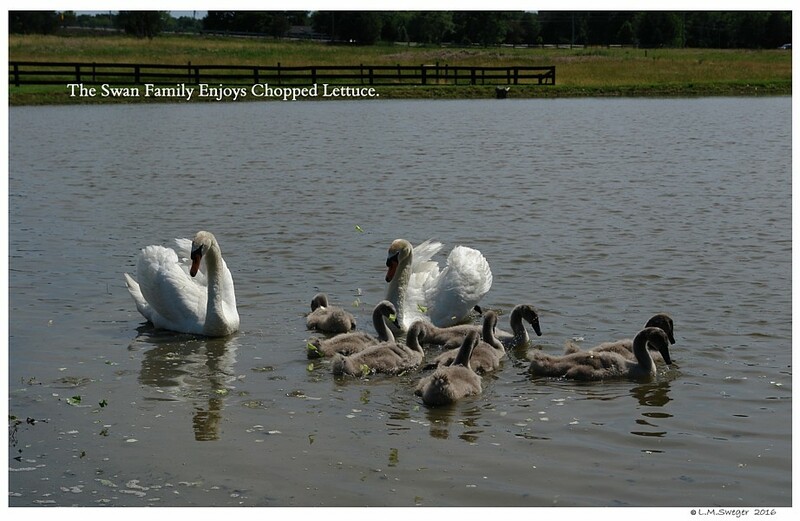 Cut the Opening Lower or Higher for Cygnets Size. 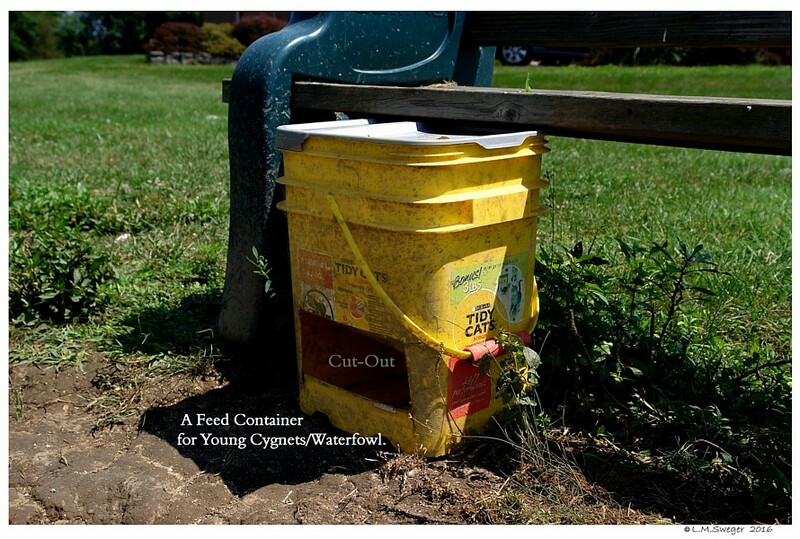 Always place Feed in a clean Container or in shallow water. Week Two: Add small amounts of Cracked Corn/Wheat “Scratch” 10%. Week Three: Increase – a little more “Scratch” 20%. Week Four: Add a little more “Scratch” 30%. 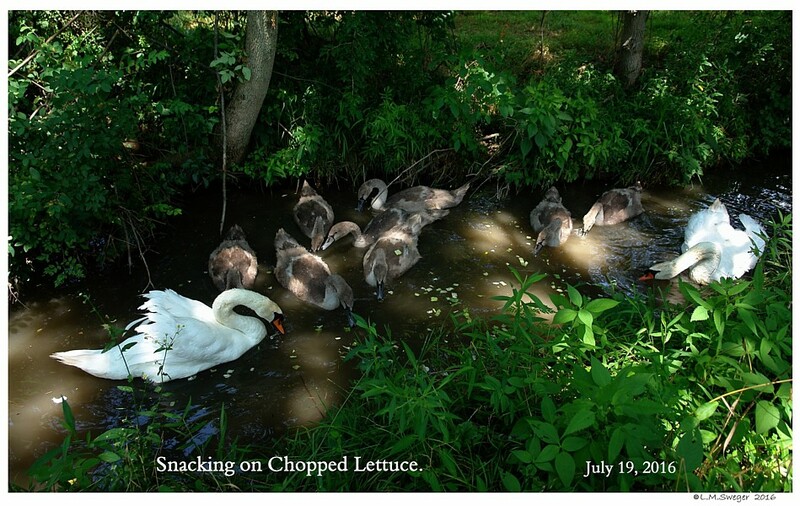 – Watch to see what the Cygnets are eating. 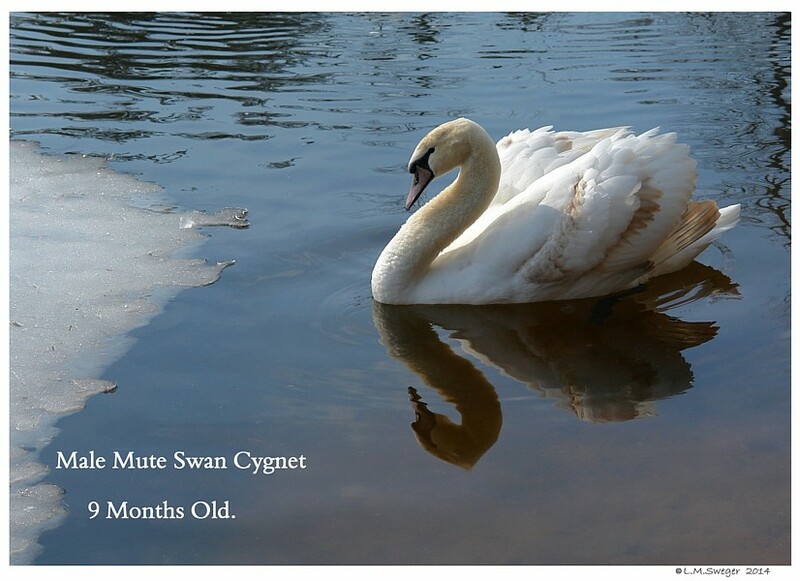 By Five Weeks Mute Swan Cygnets will weigh appx. 4-5 Pounds. 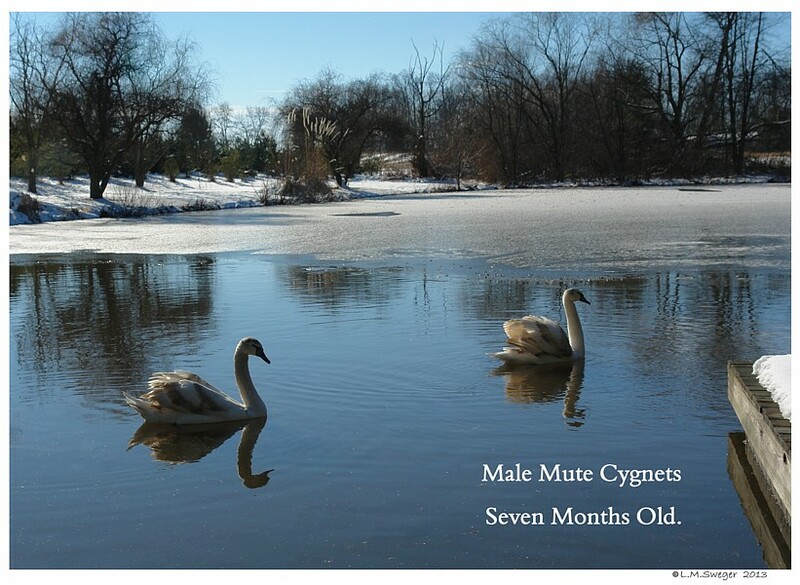 By Six Weeks Mute Swan Cygnets will weigh appx. 5 Pounds. 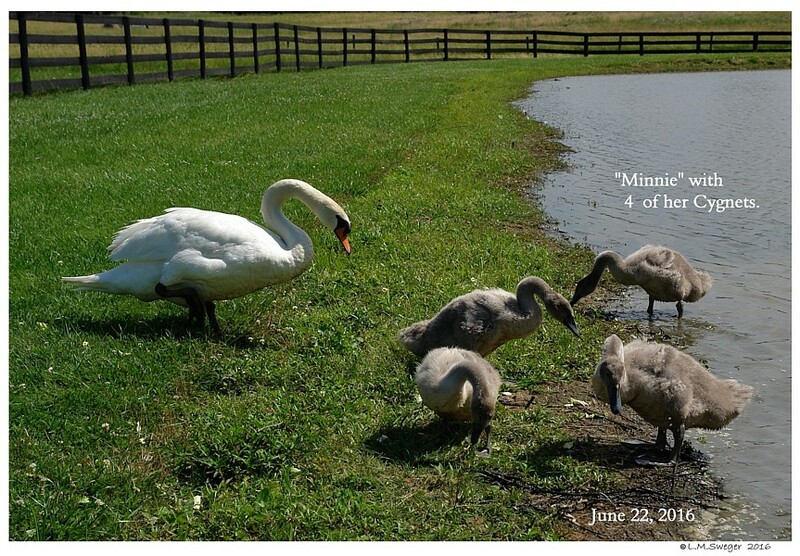 By Seven Weeks Mute Swan Cygnets will weigh appx. 6-7 Pounds. The Males gain about 16 Ounces Per Week. The Females gain about 12 Ounces Per Week. 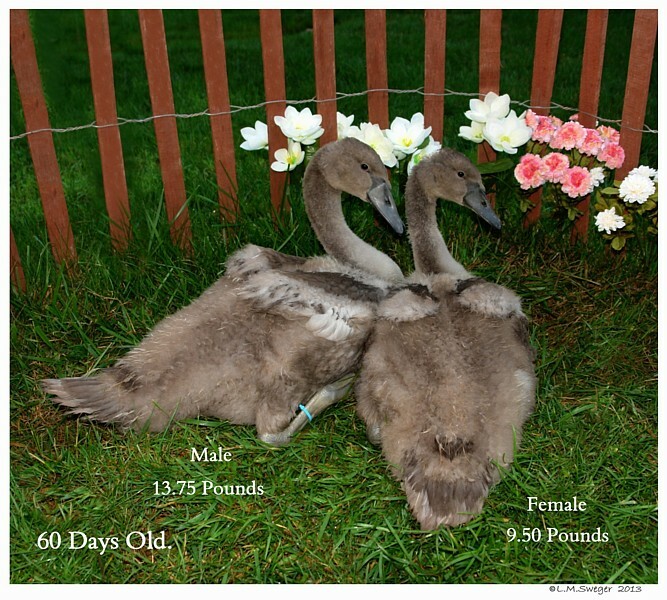 By Eight Weeks Mute Swan Cygnets will weigh appx. 8-10 Pounds. Their first True Feathers will start to Grown In.. !!! Cute Stage. The Cygnets look like they are wearing shaggy fur shoulder stoles. 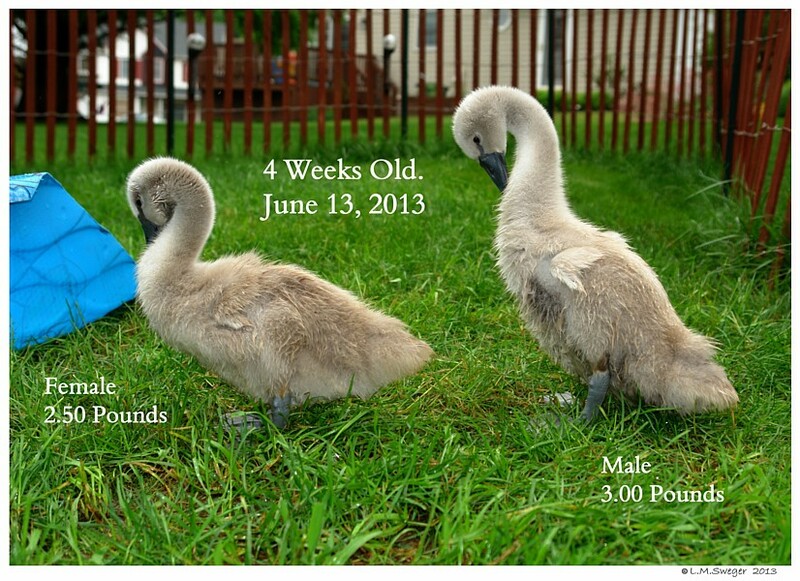 By Nine Weeks Mute Swan Cygnets will weigh appx. 10-12 Pounds. We have Switched to this Product. Less Waste-Better Price. An Aut-O-Dine in Shallow Water adjusted for Growing Cygnets. The Floating Pellets Float for Good Usage.. Some of the Whole Corn will Sink, Soften and be Eaten Later. By Twelve Weeks Mute Swan Cygnets will weigh appx. 12-15 Pounds. At This Stage the Cygnets should be able to Eat the Floating Pellets that the Adult Swans are Eating. 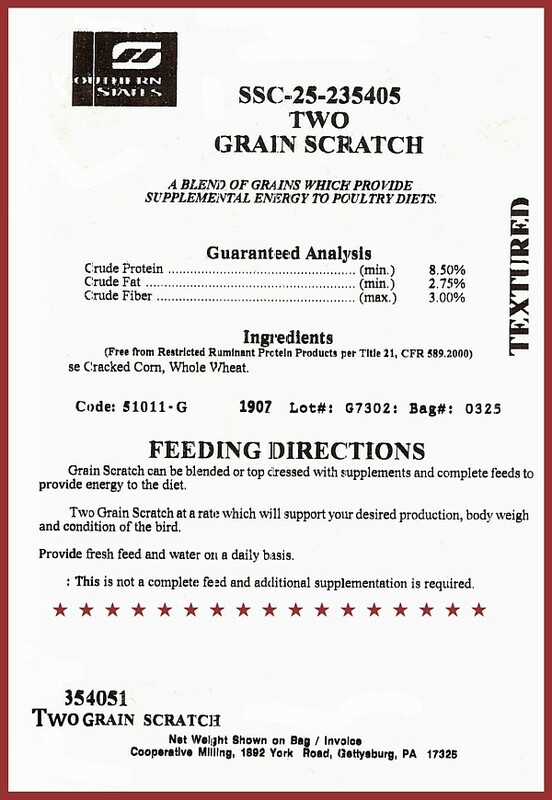 Provide Scratch and Vegetables to keep the Diet Protein Value Reduced.. This Feed Mixture is good for the rest of the First Year. Adequate Greens and Plant Materials will help keep the Protein Level down. 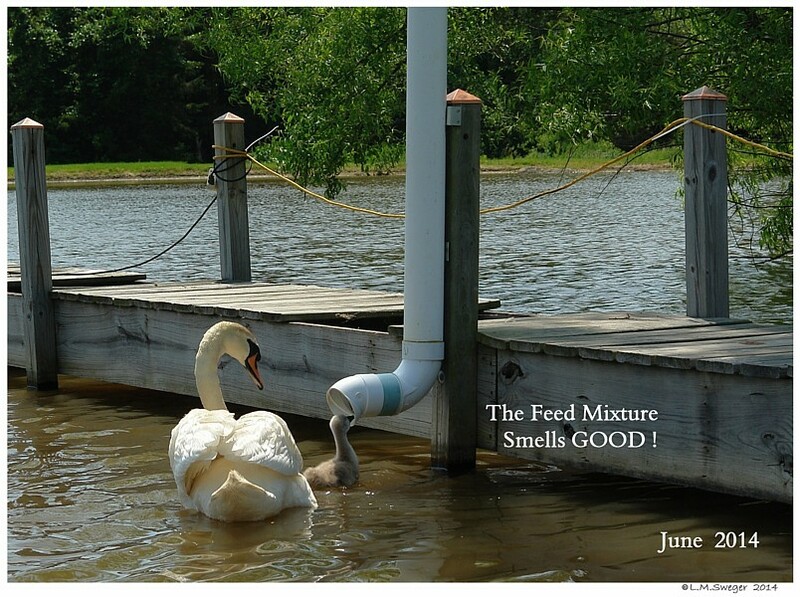 There are various Commercial Feeds that will be a Good Start to a Healthy Diet for Swans. Whether you have Extruded Pellets, Crumble or Floating Pellets available you will need to prepare the Feed Mixture for your Environment. 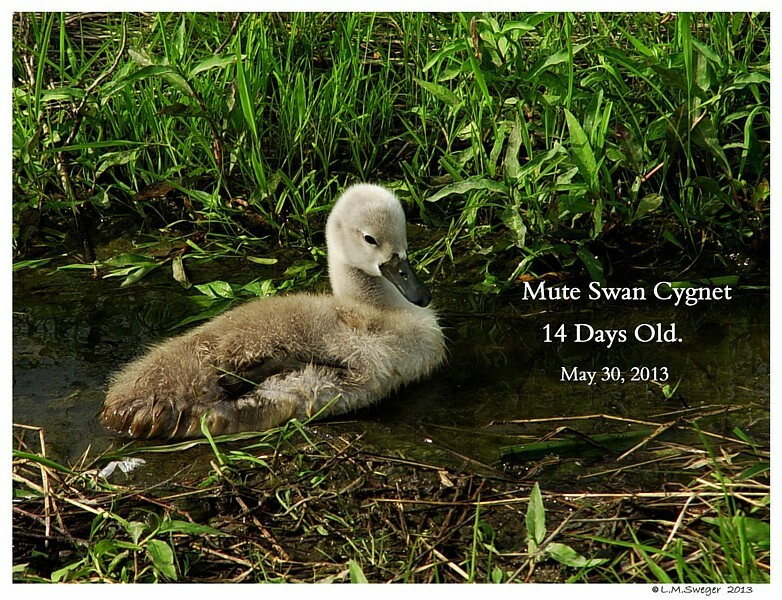 Male Mute Swan Cygnet Five Months Old. 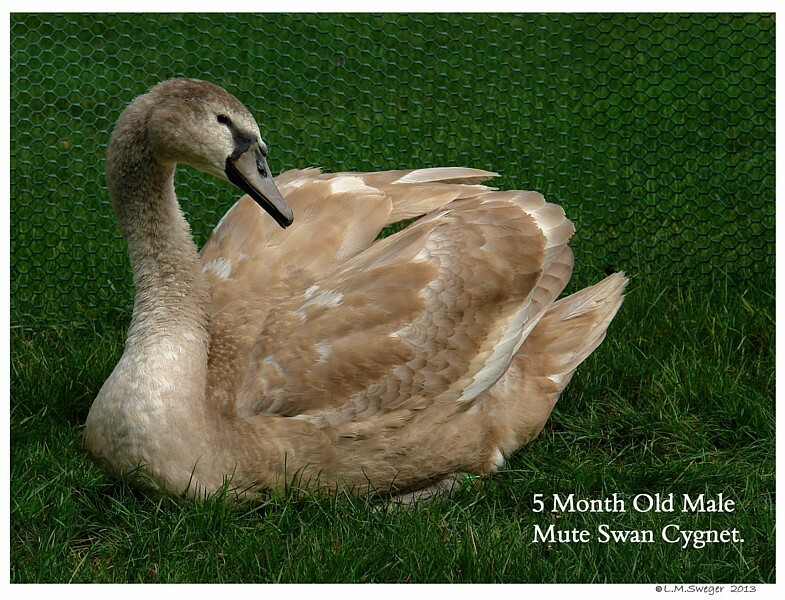 Male Mute Swan Cygnet Six Months Old. Mute Swan Cygnets Seven Months Old. 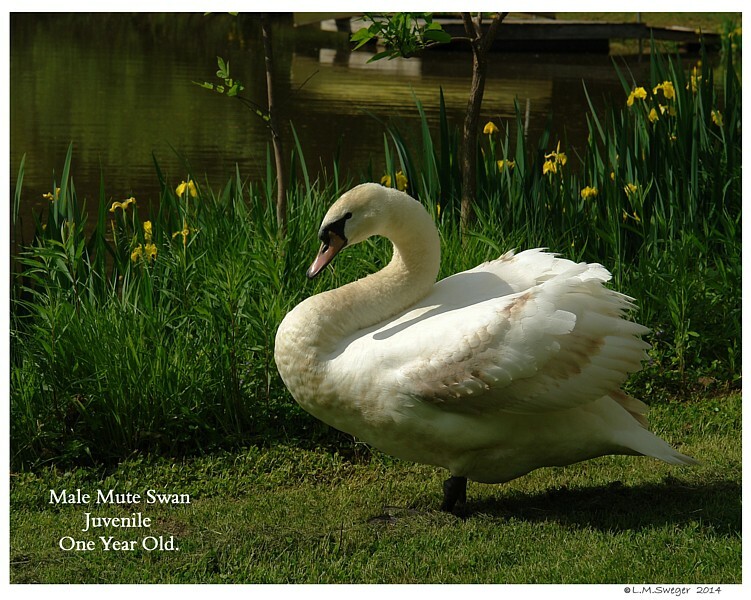 Male Mute Swan Cygnet Nine Months Old. Healthy Mute Swan Cygnets will weigh approximately 20-26 Pounds. A PROPER Diet will help minimize Weak Bone Problems, “Angel Wing” and internal Organ Damage. 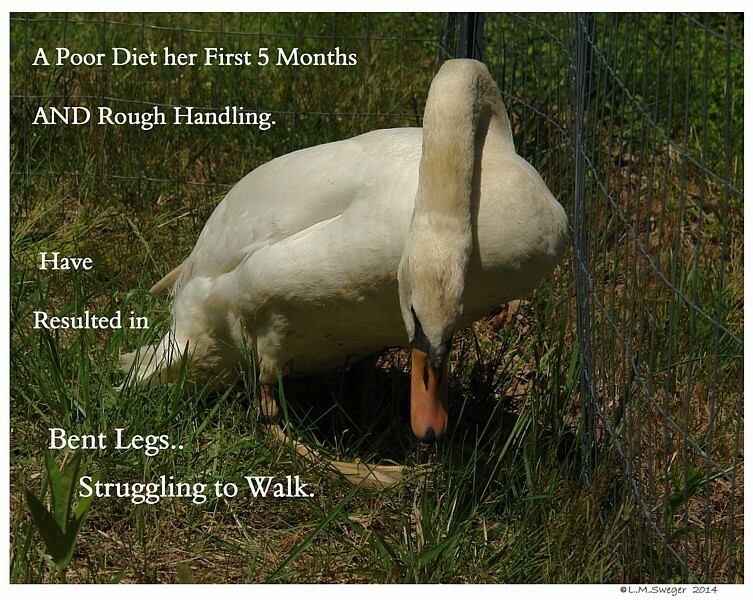 An Improper Diet will shorten a Swan’s Life. 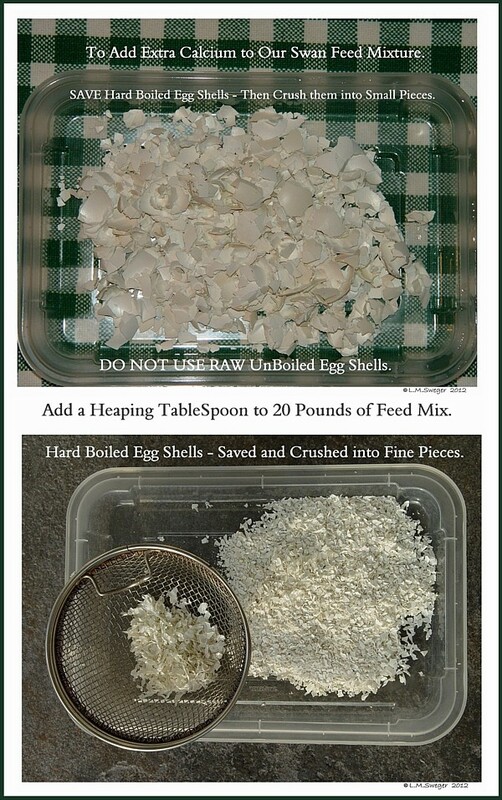 If the Feed you use is low in Calcium.. You can add some Crushed BOILED Egg Shells. One Tablespoon Mixed into 15 Pounds of Feed Mixture. 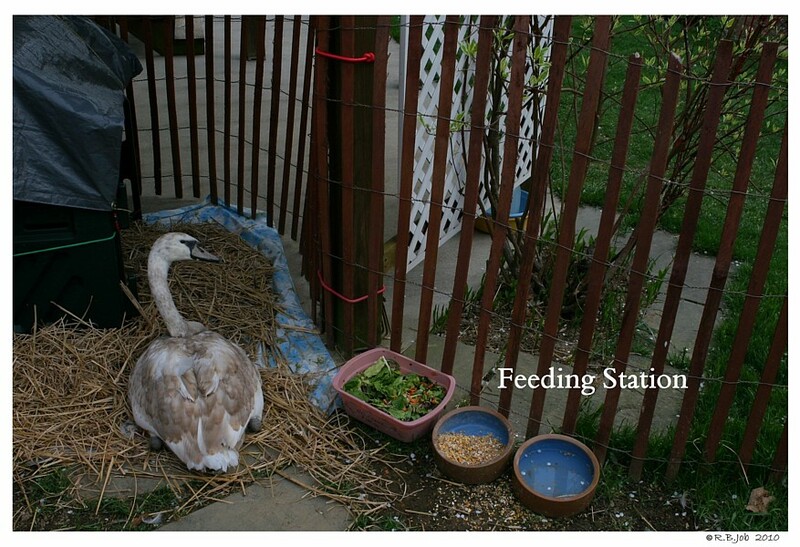 You can not Over-Feed a Swan – they Self-Regulate. 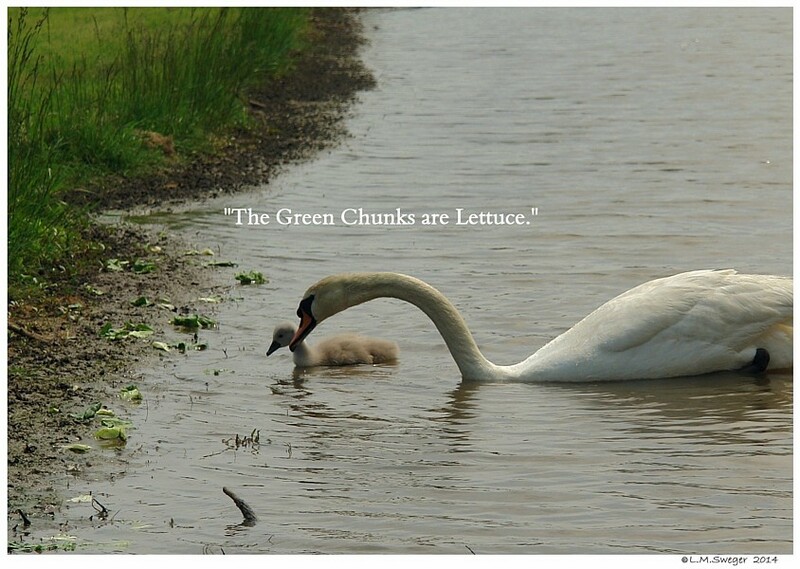 Swans are not greedy Creatures and will only eat what they need. 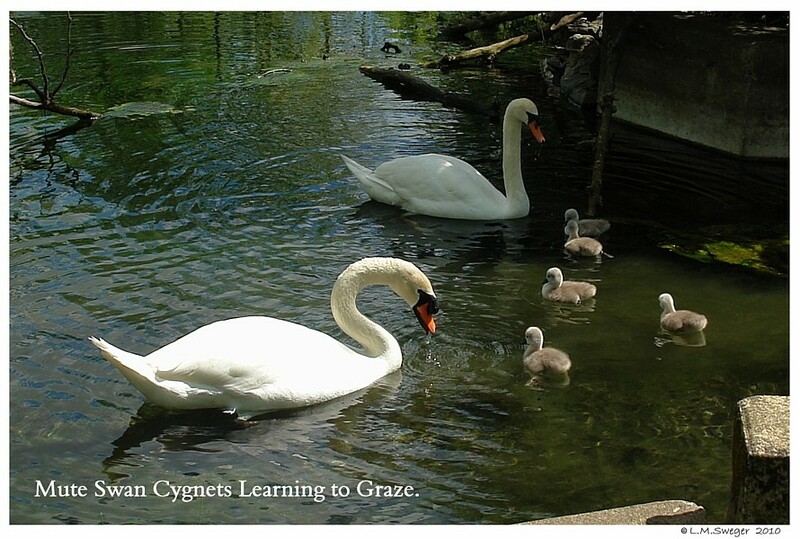 The Dominate Cygnets will prevent the Submissive Cygnets from eating if there is Insufficient Food Available. 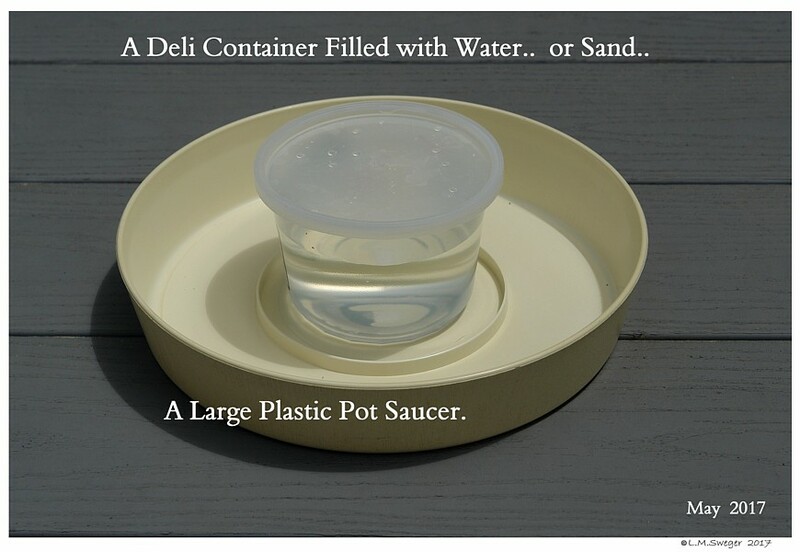 You are providing adequate Food, if there is a small amount left in their Container after 24 hours. 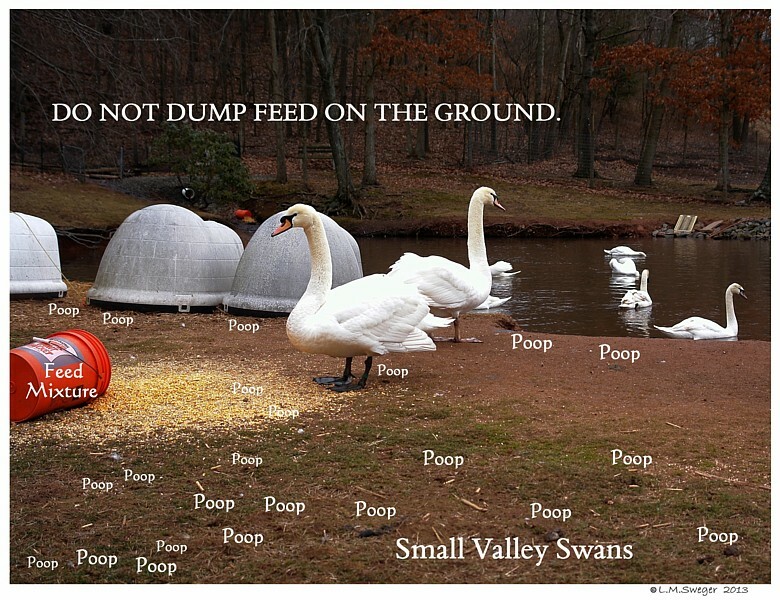 Keep in mind there may be other birds or animals, rodents eating the Swans’ Feed. Adjust to be sure the Swans get enough for themselves. Rodent Saliva and Waste can carry Fatal Diseases. FEEDING SWANS IN THE COLD WINTER MONTHS. 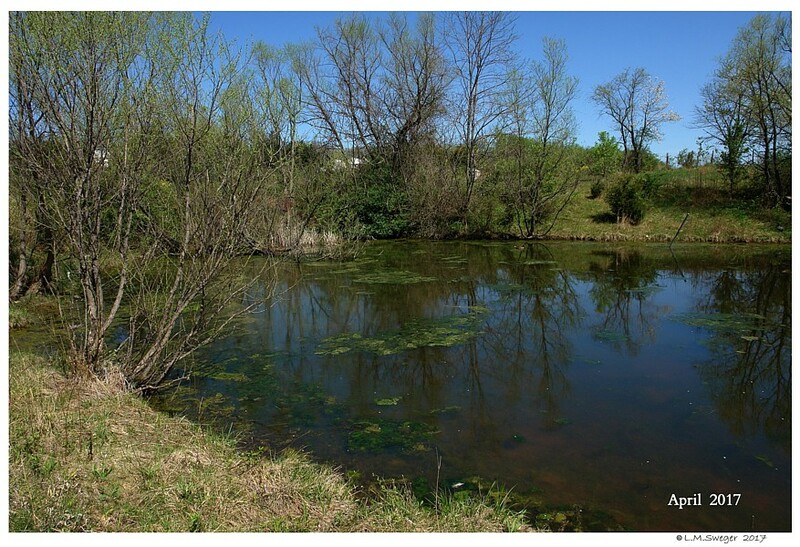 In the Winter, Natural Food in the Pond Water will become scarce. 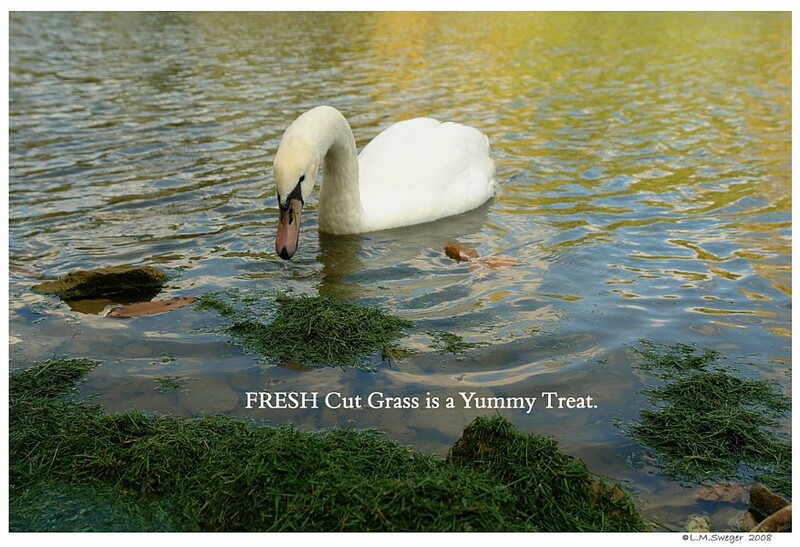 there is VERY little Nature Food for Swans to eat. 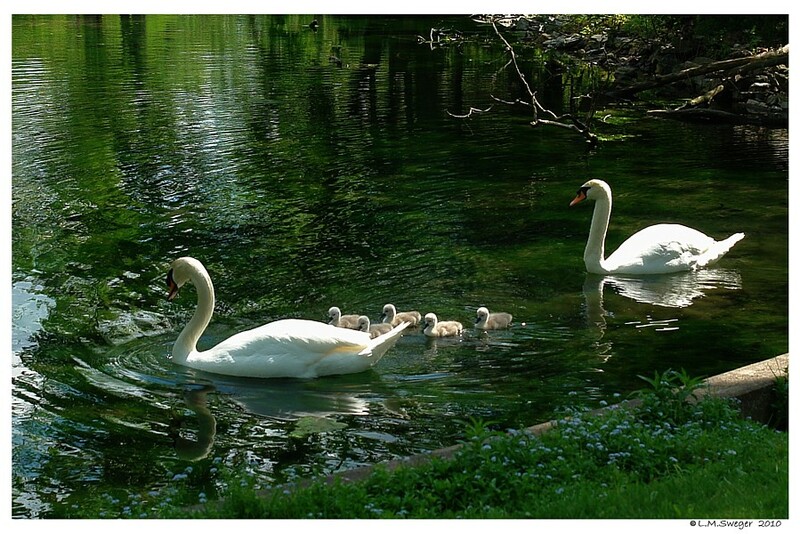 The “Cob” may drive off his Young Cygnets to fend for themselves. Doing this, he and his Female will have a better chance of surviving until Spring. 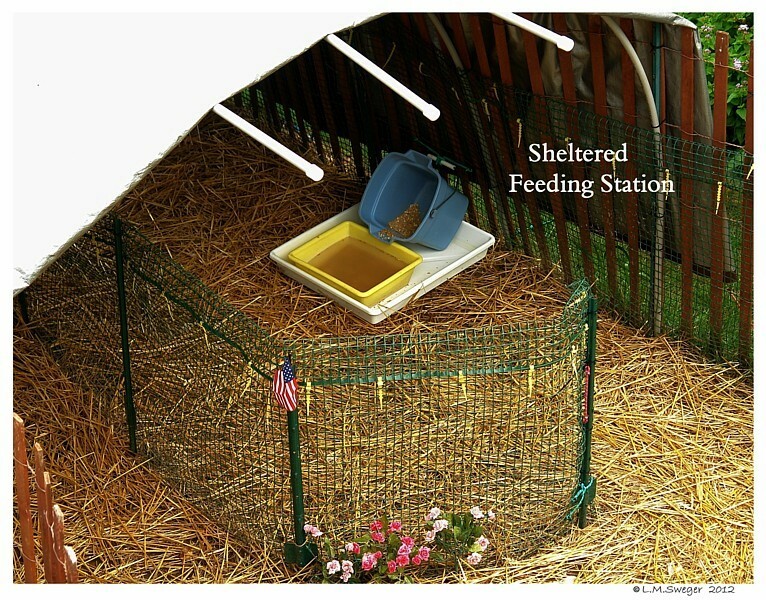 Providing Supplemental Feed will help prevent this. 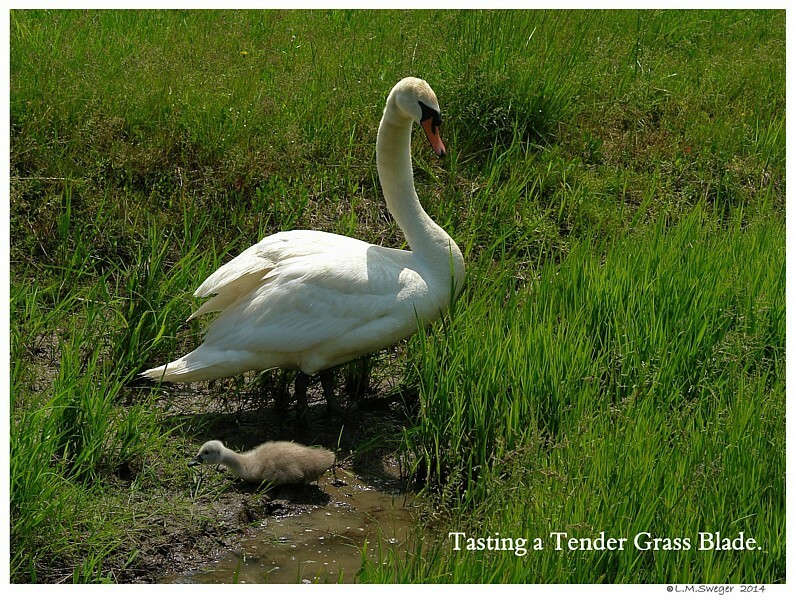 When Food is adequate the Adult Swan Pair will be more likely to keep their young with them until the Adults are ready to breed again the next Spring. 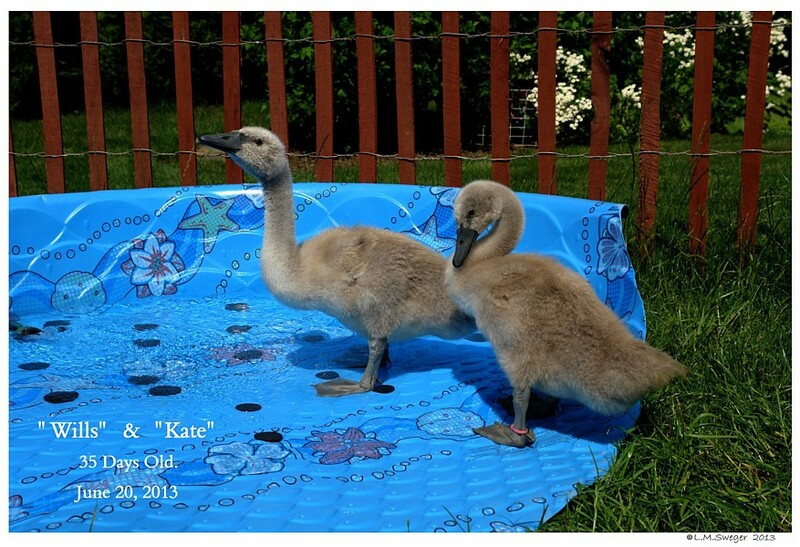 It is a GOOD Plan to have New Homes ready for Surviving Cygnet by the middle of November when they are 6 months old. They MUST be moved to new Homes by 8-10 months of age. The Parent Swans will start to “Drive-off” their Cygnet as their Mating Hormonal start to increase in late January-February… The chasing will change to attacks if the Cygnets do not leave. Published on Apr 6, 2012 Video takes a Long time to Load. Time to say good bye and good luck to the 2011 Cygnets at Reddish Vale Country Park, the Cygnets hatched in June 2011, three out of four survived, their Parents are now ready to nest and they have to chase their Cygnets away. Reddish Vale is a loosely defined area in the Tame Valley close to Reddish in the Metropolitan Borough of Stockport, Greater Manchester, England. Pinioned Cygnets are unable to Fly-Off.. They need to be MOVED to a new home. 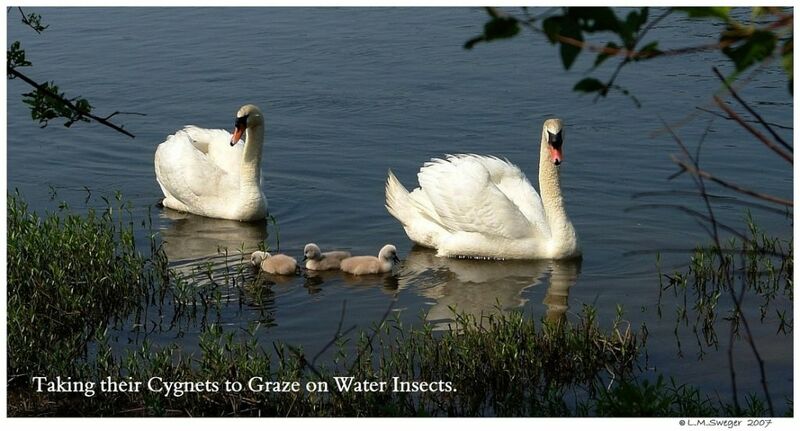 The Adults will increase the attacks until they injury or kill their Cygnets. 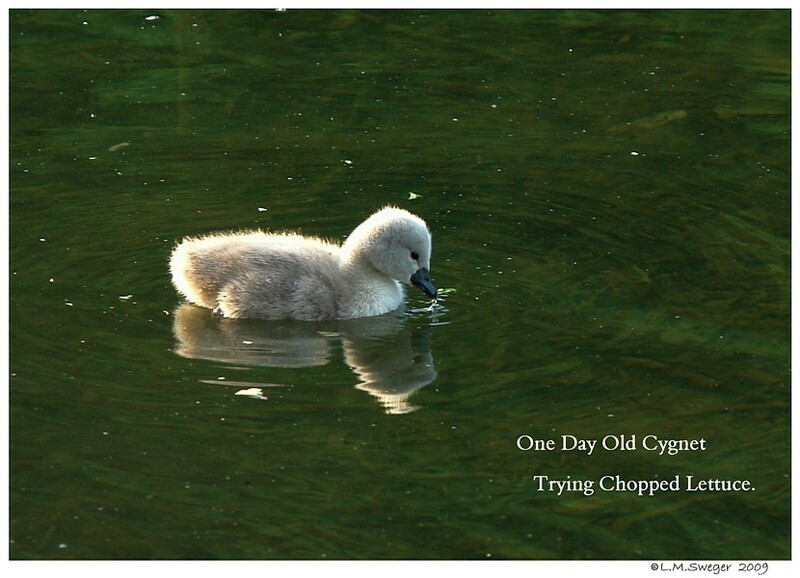 Injuries will often result in Crippling the Cygnets which often results in the Cygnets suffering and dying. Even their Siblings will start to pick on the injured Cygnets.. They become helpless. 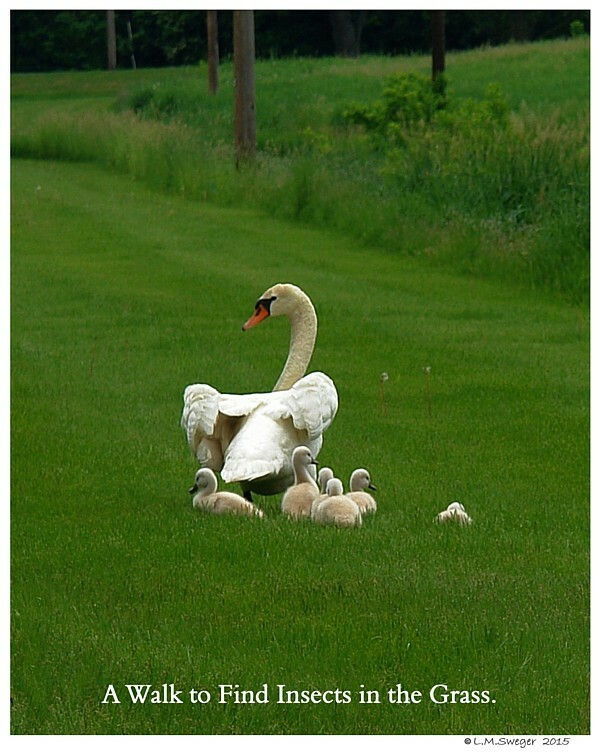 Normally, in Countries where Swans live “Wild and Free” the Cygnets find their way to non-breeding Flocks ( Juveniles 1-3 years old). They will live with these “Juvenile Groups” for several years and eventually choose a Mate. The Young Adult Pairs will leave the Juvenile Group to find their own Breeding Territory. I will do my best to seek good general Information about Swans. 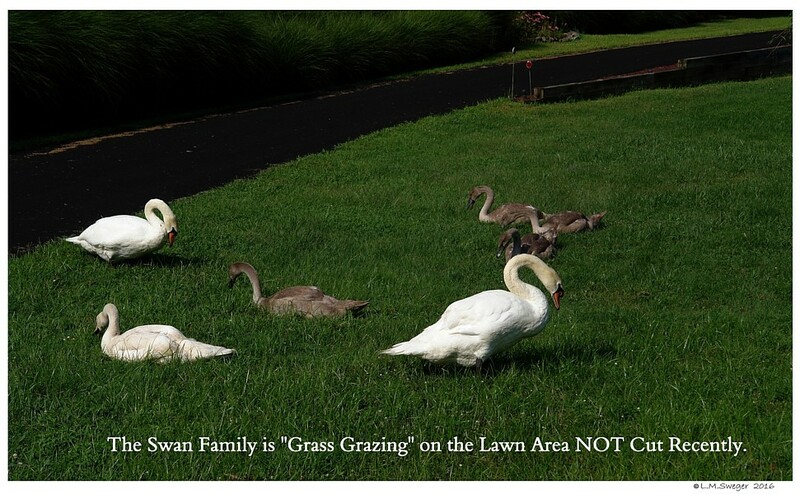 The WebSites Below have a wealth of General information about Swans. You can Send them Questions by EMail.. and they will Reply. 12615 County Road 9, Plymouth, Minnesota 55441-1248 U.S.A. 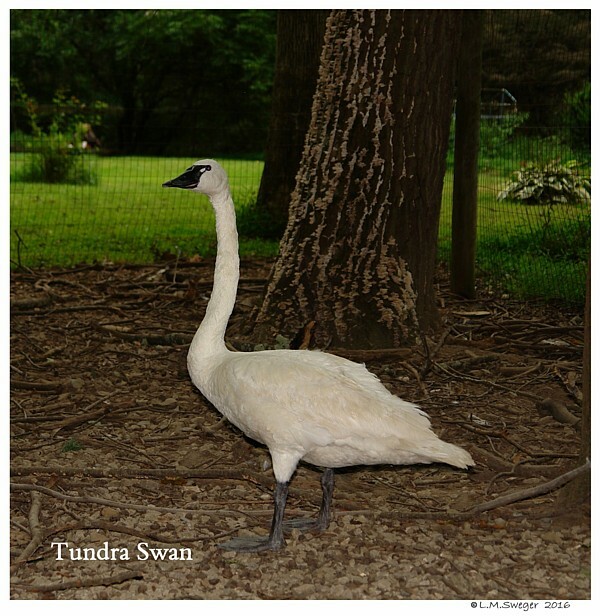 Legally care for a Wild Trumpeter or Tundra Swan. help capture, evaluate injuries or medical needs. in your area familiar with Swans. Your STATE should have a Department of Agriculture to assist you. Check their location and phone Numbers – being prepared is a good plan. 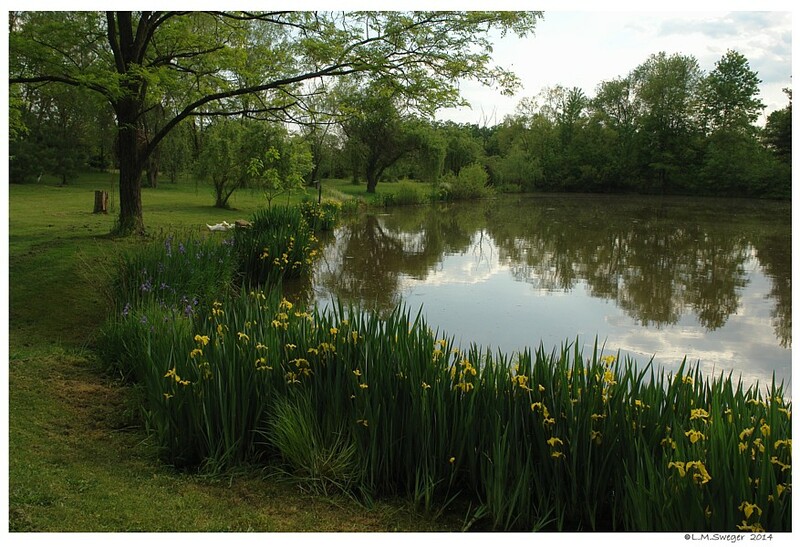 Your State Department of Agriculture can be helpful with Pond Environment Problems.